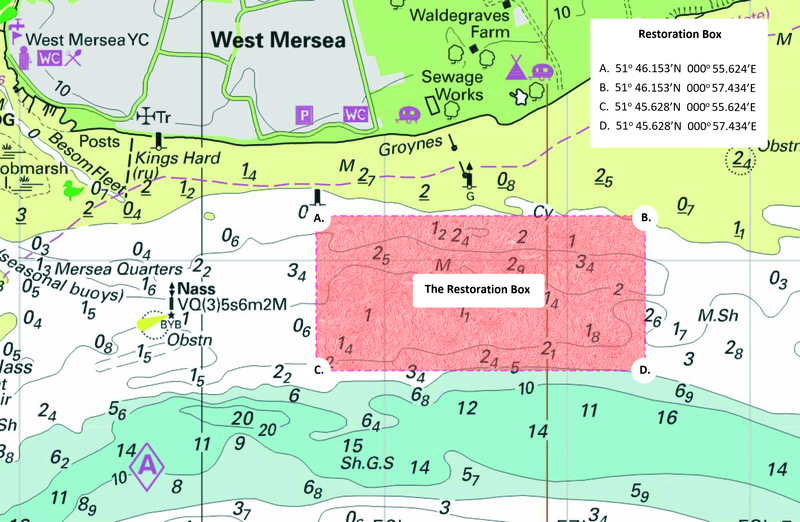 Starting on 29th April 2019 works will commence on the Essex native oyster restoration project within a defined restoration box, of which the north-west corner is located approximately 500m offshore to the south-east of West Mersea (hereafter referred to as the ‘Restoration Box’). The Restoration Box is approximately 2000m (west to east) by 1000m (north to south). 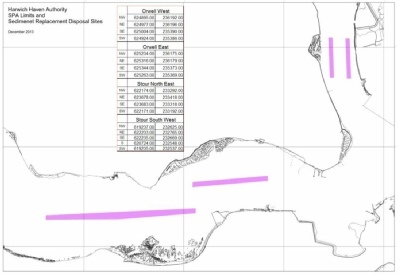 The works will include the deployment of shell and stone onto the seabed in six locations (approximately 10m x 20m, and 30cm in height) in the south-west corner of the Restoration Box (approximately 500m x 700m area). The works will be carried out from the Dredger Earn (80ft x 21ft) and Tug Edgar (40ft) and are expected to be concluded before week commencing 13th May 2019 subject to satisfactory weather conditions. During the works, mariners are requested to keep clear and avoid any unnecessary wash. On completion of the works, the deposited shell and stone will remain permanently in place on the seabed. 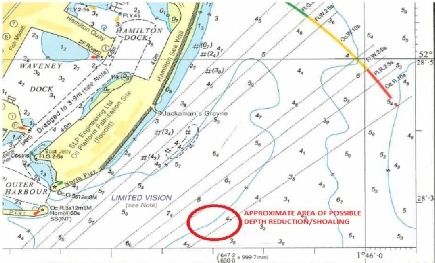 Mariners are therefore requested to be mindful of the raised seabed in this location. Other activities to take place include deposition of spat collectors (to be the subject of a separate Notice to Mariners) and restoration management. These activities will take place in June, July and August 2019 (exact dates to be confirmed). Restoration management will take place from a dredging (fishing) vessel. Works are due to commence the week beginning 22nd April 2019 at Halls Northfleet Jetty.  installation of new two new monopoles and associated fenders. All works will be undertaken from a ‘Ravenstein’ spud leg barge (24m x 17m) with the assistance of the tug, HORTON. An additional safety boat will also be in attendance. All vessels will maintain a listening watch on VHF Channel 68. When works are underway a ‘Proceed with Caution’ will be broadcasted by London VTS on VHF Channel 68. For the latest information contact London VTS on VHF Channel 68 or by telephone on 01474 560311. 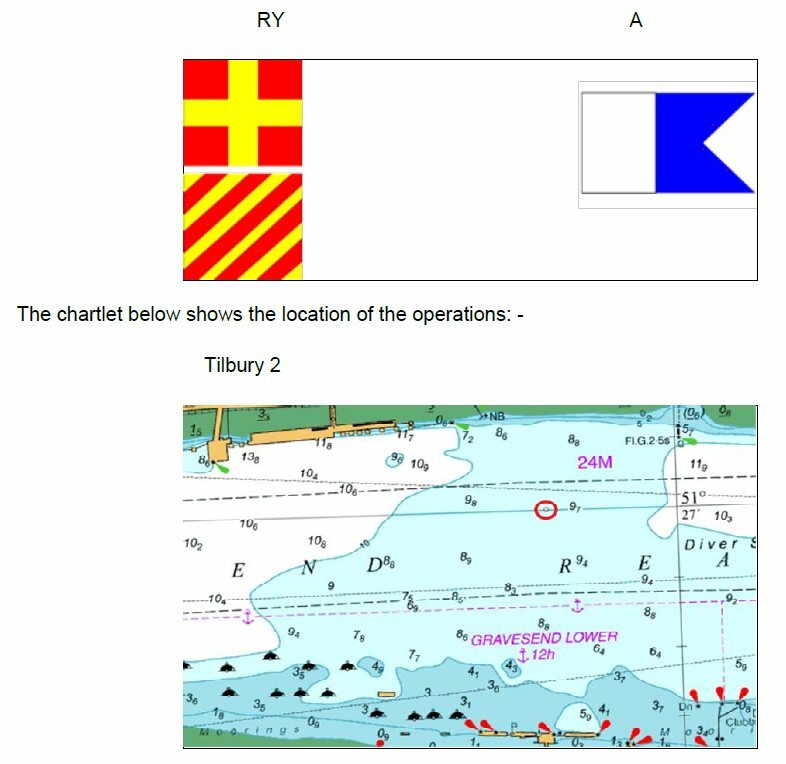 Notice to Mariners L14 of 2019 referencing the above works at Tilbury2, have been cancelled, and will be rescheduled at a later date. 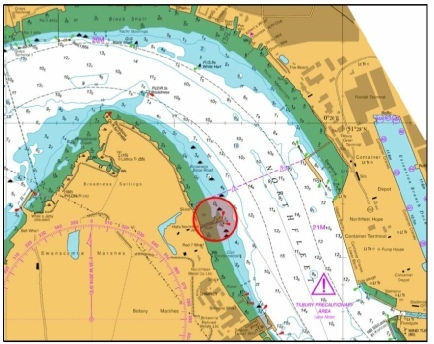 Mariners are advised that on or about the 23rd April 2019 the plough dredger TEDDY will commence maintenance dredging of the Harwich Haven berths and approaches for approximately 15 days. 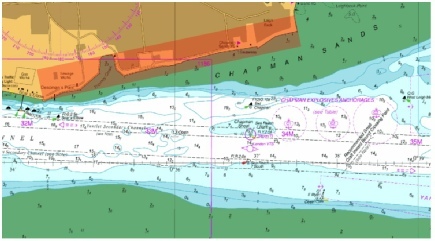 Mariners are also advised that on or about the 25th April 2019 the trailer suction dredger HAM 316 will commence maintenance dredging of the Harwich Haven berths and approaches for approximately 10 days. 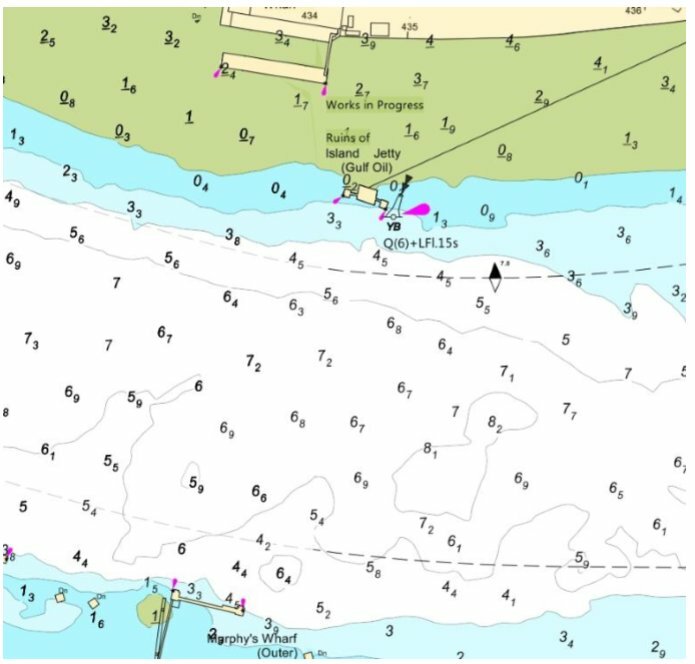 Survey work in regard to the dredging operations will be conducted by the survey/crew vessel Havlik, due to commence work from 18th April 2019. These closures are required to accommodate the prestigious 5k Twilight Road Race which is taking place around the Wet Dock. Please schedule your trips accordingly on this day to take into account these Lock Closures. Please contact Orwell Navigation Service on VHF Ch 68 for all the latest Information. 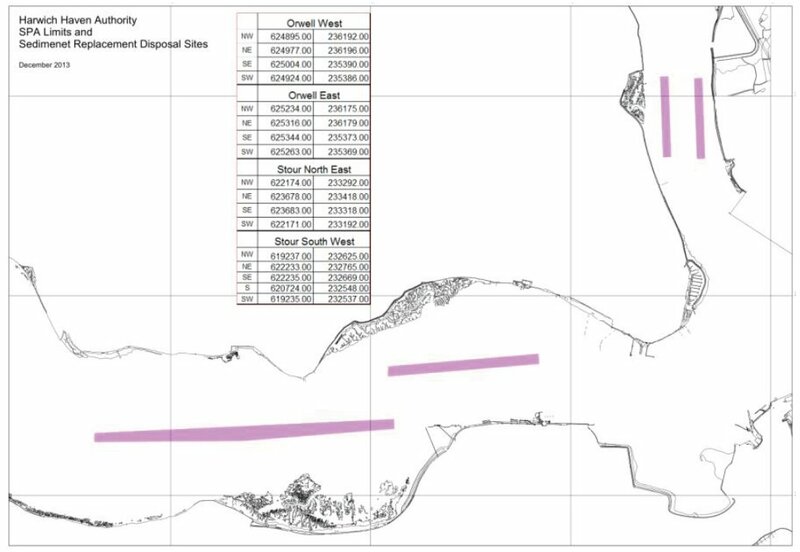 Mariners are advised that the Grab Dredger ‘Mannin’ will be undertaking a dredging campaign within the Port of Ramsgate, commencing the 25th April 2019 over a period of 3 weeks. and vessels are requested to pass at low speed. Mariners are advised that the No.6 buoy is currently showing incorrect flash rate. Rectification works are presently underway. • A 50m radius advisory caution zone is established around each wind turbine and offshore substation platform. 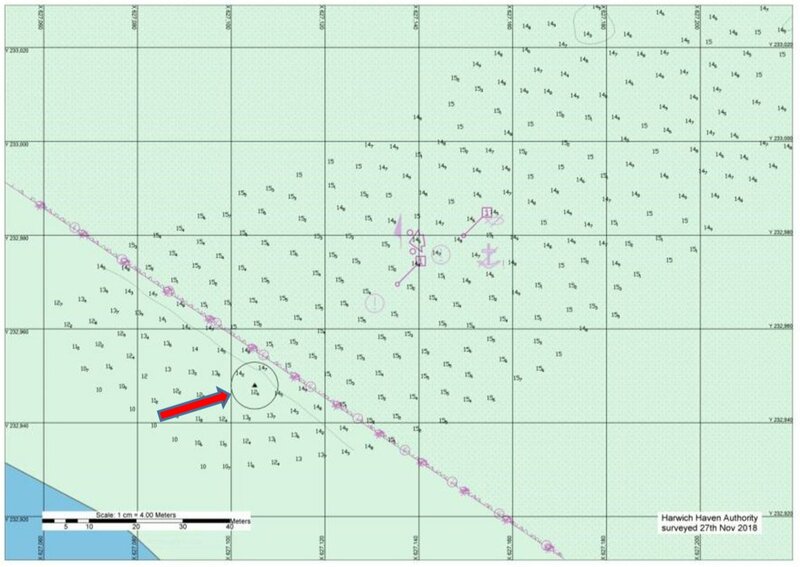 • A long term 500-meter exclusion zone has been implemented around D20 - (51° 38.024'N 01° 24.612'E) as a precaution until further notice due to a damaged blade. • A short term 500-meter exclusion zone has been implemented around C17 - (51° 37.132'N 01° 25.641'E) this location stands in the Foulgers Gat channel and a wide approach is requested. • The MPI Adventure will move from WTG to WTG, spending approximately 36-48 hours at each location. When located at a WTG, a 500-meter exclusion zone will be put in place centered on the MPI Adventure. • Short term 200-meter exclusion zones will be in place at various locations while MPI Dulcinea is carrying out rope access works. • The Bokabarge 82 will move from WTG to WTG carrying out cable maintenance works. 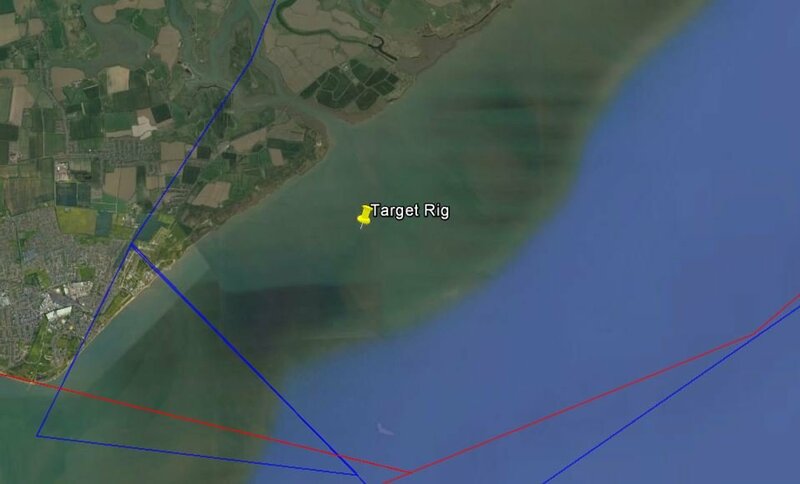 Whilst operational, and in transit, a 750-meter exclusion zone will be put in place centered on the Bokabarge 82. London Array Wind Farm dated 23rd April. NOTE from CTTE: D20 is well clear of Foulger's Gat. C17 is on the west side of Foulger's Gat and in consequence needs to be kept well clear. 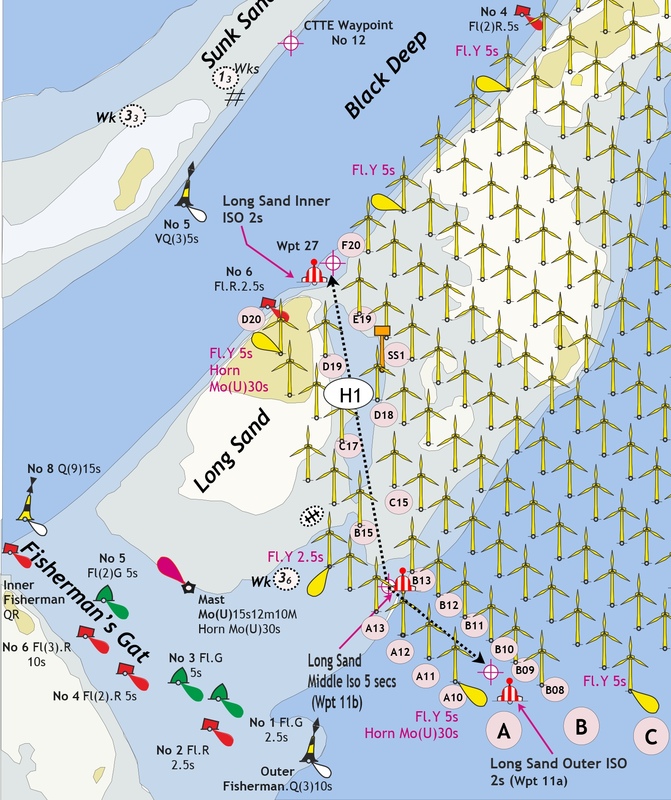 Call a LAL vessel before entering the Wind Farm if possible is their request. Work to remove the Marsh Farm Jetty and the lower end dolphin of the former Tilbury Power Station Jetty will commence the week beginning 22nd April as part of the TILBURY2 development. A 75m spud leg barge will be utilised for the removal of the structures along with a transfer barge and the multi-cat vessel, SEADOG. Scaffolding will be rigged on the structures to assist with removal and lifting. Lifting operations will be carried out at as required during which time London VTS will broadcast a ‘Proceed with Caution on VHF Channel 68. All vessels involved with the works will maintain a continuous listening watch on VHF Channel 68. At times International Code flags “Romeo Yankee” will be exhibited in conjunction with a “Proceed with Caution” being broadcast by London VTS. Removal works are expected to last for approximately 6 weeks. NOTICE IS HEREBY GIVEN that the floating dock/converted barge Westmoreland, that has been moored between two large yellow mooring buoys to the north of the Lower Halstow Yacht Moorings, has sunk. The owner is aware and will be dealing with the situation. Please be advised that Burnham Yacht Harbour Marina Ltd have now completed their Maintenance Dredging Operations in the approach to and within Burnham Yacht Harbour, Burnham on Crouch, Essex. NOTICE TO MARINERS NO 38 of 2018 IS HEREBY CANCELLED. Mariners and Port Users are advised that continued hydrographic survey operations will be taking place in Lake Lothing on Monday 15th and Tuesday 16th April. These will be conducted using a remote controlled surface vessel (photo below), operated by ‘Survey Solutions’. The craft will be remotely controlled from the quayside. 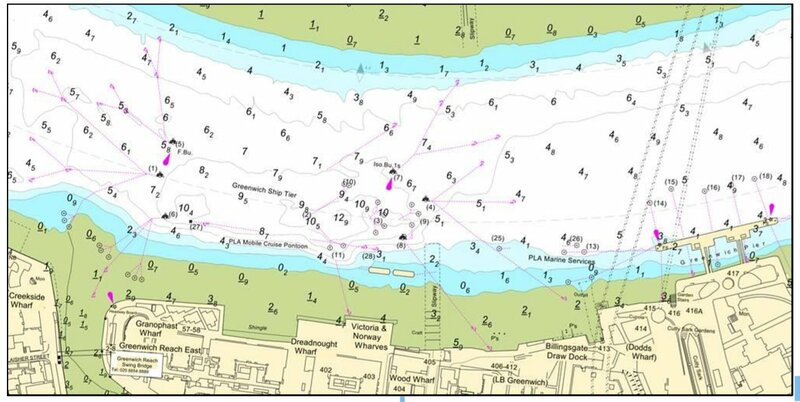 The survey area will extend across the river from North quay 5 and Kirkley Ham (shown on below chart extract). The survey will only be undertaken in daylight hours and will be subject to favourable weather conditions. The remote craft will be launched from Silo quay steps. A shore side team operating the craft will be monitoring VHF Ch14 during the survey and all river traffic will be given priority. Please contact Lowestoft Port Control, VHF Ch 14, Tel. 01502 572286, if additional information is required. The foreshore and river wall on Canvey Island between the Chapman Anchorages and Scar’s Elbow is a popular public beach and amenity. For members of the public using the beaches and the river wall there are potentially serious implications from the dangers of wash and draw-off from passing vessels. Consequently, all vessels are requested to be mindful of the effects of wash and draw-off in this area, especially over the high water periods during daylight hours. Masters are reminded of the requirement under Port of London Thames Byelaw 57 that any wash or draw-off created by their vessel must not compromise the safety of others using the Thames and the foreshore. Additionally, users of personal watercraft (e.g. 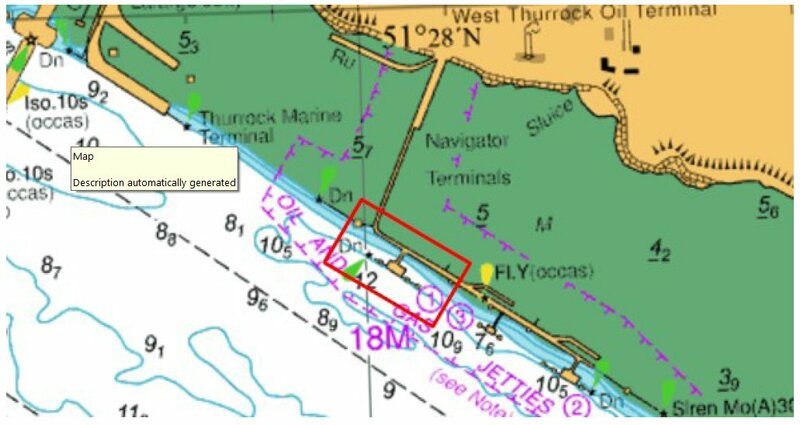 “jetskis”) are advised that they must not operate at speeds in excess of eight knots within 200 metres of a public beach, and that the launch or recovery of a personal watercraft from an unauthorised location (such as Thorney Bay Beach) is prohibited under Port of London Thames Byelaw 14. The obstruction has a drying height of 0.5 meters above chart datum. NOTICE TO MARINERS NO 3 of 2019 IS HEREBY CANCELLED. Vessel CHERRY SAND – Due to commence work at Lowestoft on 05/04/19. Expected duration of works: 16 to 17 days. Normal working hours: 07:00 to 19:00hrs. 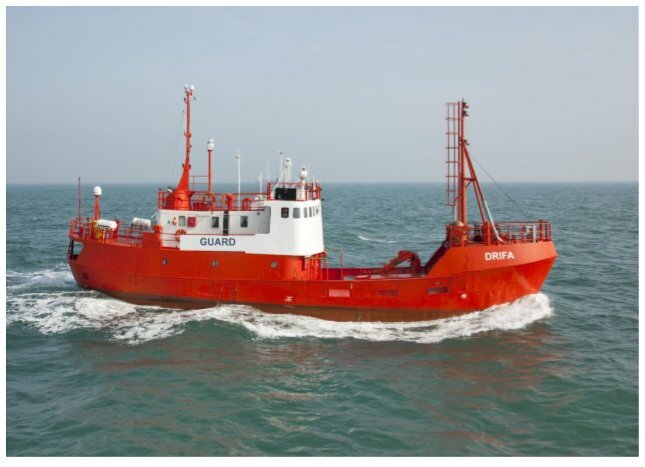 Vessel UKD ORCA – Due to commence work at Lowestoft on or around 19/04/19. Expected duration of works: 5 days. Normal working hours: 24/7. Vessel UKD SEAHORSE – Due to commence work at Lowestoft on or around 27/04/2019. Expected duration of works: 8 days. Normal working hours: 0700-1900hrs. The dredgers will be working in both Lowestoft Inner and Outer Harbour areas. They will display lights and shapes for dredging activities as prescribed in the International Regulations for Preventing Collisions at Sea. The vessels will maintain a listening watch on VHF Ch 14. Vessel movements will be co-ordinated via Lowestoft Port Control. Mariners and Port Users are requested to afford the dredgers a wide berth while they are working. Please contact Lowestoft Port Control, VHF Ch14, or Tel. 01502 572286, if further information is required. 51°.19’.59N - 001°30’.80E, is currently missing. Mariners are advised that the pontoon berths at Ha’penny Pier, Harwich will be operational again from Saturday 30th March 2019. Notice to Mariners no.12-2019 is cancelled from Saturday 30th March 2019. Visiting leisure vessels up to 20 metres length overall (LOA) can use the facilities at Ha’penny pier pontoons for a maximum stay of 72 hours. Moorings cannot be booked in advance as we operate on a first come first served basis. Be advised that vessels may be double or triple berthed if the mooring facility is busy and prevailing conditions are suitable. 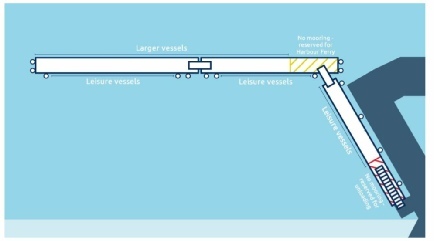 As shown on the diagram above, the outside berths are prioritised for larger vessels and the inside berths are predominately for smaller crafts. Leisure vessels must not moor in the harbour ferry or unloading areas, which are clearly marked on the map. Operators who are registered charities are entitled to a 50% discount. Fishing vessels are restricted to using the unloading area of the pontoon, which is clearly marked. Leisure vessels can pay mooring fees directly to the pier master who is located in the office next to the Café on the Pier. Fees will be collected after 1600 and before 0900 the following morning. Cash and electronic payments are accepted. CCTV The area around the Ha’penny Pier pontoons is monitored by CCTV 24 hours a day. Please adhere to the warning signage in the pontoon area at all times. Do not remove temporary No Mooring signs in any circumstances. The re-fuelling area – marked on the map – is for the exclusive use of the area’s fishing vessels. Mooring in the area is strictly prohibited at all times. The gate at the top of the pontoon gangway will be closed between 17.00 and 08.00. The gate allows visitors to exit the pontoon area, but does require a code to access on return. Visiting craft that intend to stay overnight will be provided with the pontoon gate code on arrival. Visitors using the pontoon after 17.30 who do not intend to stay overnight can obtain the gate’s code by calling 07748 154039. Please note this phone is only manned until 21.00. The Toilet and shower facilities located on Ha’penny Pier require a code to access, which will be provided to you by the Pier Master on arrival. A water tap is located on the inside of the sea defence wall at the entrance of Ha’penny Pier, which is the property of Tendring District Council – 01255 686868. The mooring facility is affected by both wind and tides and sometime it might not be possible to use the facility. During challenging conditions, the bridges between pontoons will be raised to protect them from damage. In such situations skippers should consider the pontoons closed. Skippers should always ensure that their vessels are securely moored with fenders in place. Our pier master is always happy to advise about wind, tide and mooring conditions. Harwich Haven Authority accepts no responsibility for loss or damage to any vessel, its contents or injury to any person using the facility. Vessels entering the pontoons are advised to navigate with caution – due to floating moorings - and keep to the port side when entering the pontoons. 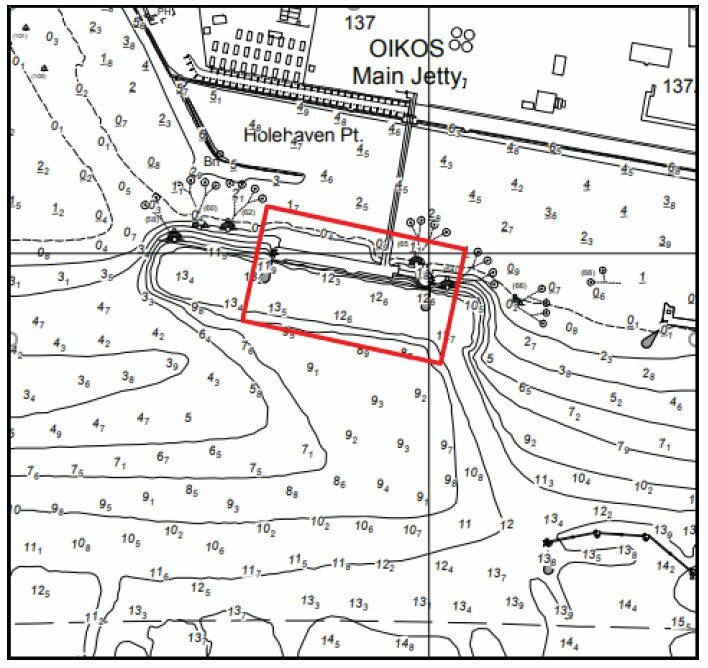 NOTICE IS HEREBY GIVEN that in advance of maintenance work on Rochester Road Bridge foreshore clearance is due to take place on Friday 29th March, in approximate position 51° 23.55’N 000° 30.00’E. This will not restrict passage of vessels using the bridge spans but all river users are advised that the workboat “Avocet” will be operating in the area to assist this clearance. She will be maintaining a listening watch on VHF Channel 74 throughout. Mariners are advised to slow down, maintain a listening watch on VHF Channel 74 and navigate with caution keeping well clear when passing. The Traffic Warning Light is positioned to assist vessels in complying with General Direction No. 10, Navigation of Vessels of more Than 130 Metres length Overall Between Sunset and Sunrise and in Restricted Visibility. 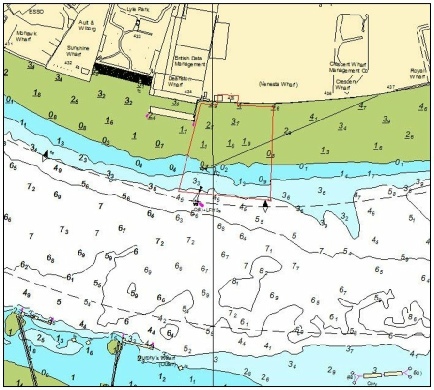 Mariners are advised of the repositioning and characteristics of 2 special lighted “NO WASH” 8 KNOT SPEED LIMIT BUOYS in Longpole Reach (River Crouch) at the Eastern and Western ends of Fambridge Yacht Haven’s yacht moorings abeam of North Fambridge Jetty. All vessels are requested to ensure their wash is kept to a minimum when passing through yacht moorings. Mariners and Port Users are advised that the trailing suction dredger ‘UKD Orca’ will be working in the Port of Ipswich and River Orwell from or about Friday 12th April 2019 for about 6 days. 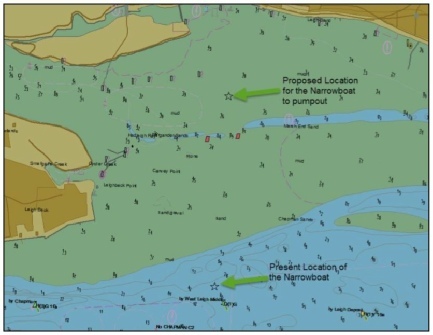 The deposit operation will take place in the Long Reach of the River Orwell. Mariners please note that during this operation there will be an unusual amount of discolouring to the water due to the increase in siltation from our deposit operation, which is being carried out in accordance with our Marine Licence. All vessels are requested to give this vessel a wide berth, especially when ‘UKD Orca’ swings in the Long Reach near No 3 Buoy following the deposit operations. 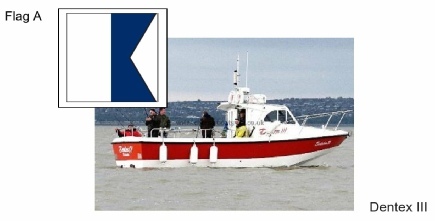 ‘UKD Orca’ will be monitoring VHF Channel 68 and showing International Signals for a vessel engaged in Dredging. Details of the vessel movements will also be available from the Orwell Navigation Service. During this period there will be no routine small boat openings. Commercial vessel openings will be considered with a minimum of 12hrs notice and subject to the works schedule. Vessels restricted to HW period port entry/departure will be prioritised. Small vessels and Leisure craft may be able to utilise a commercial vessel opening should one be scheduled during the restriction period, subject to the required transit being in the same direction, and only with consent of the Harbour Master via Port Control. Agents, Owners and Vessel masters are advised to bear this closure in mind when planning vessel movements in or out of the Port of Lowestoft. For further information please contact Lowestoft Port Control, (VHF Ch.14, Tel. 01502 572286). Notice is hereby given that the Norfolk County Council will be undertaking essential structural maintenance works of the Potter Heigham Bridge. Note that vessels will be restricted and regulated in their movement in the vicinity of the bridge on Monday 29 April 2019. Passage of vessels will only be between 1100 hours to 1200 hours and 1530 hours to 1630 hours. TG419184. 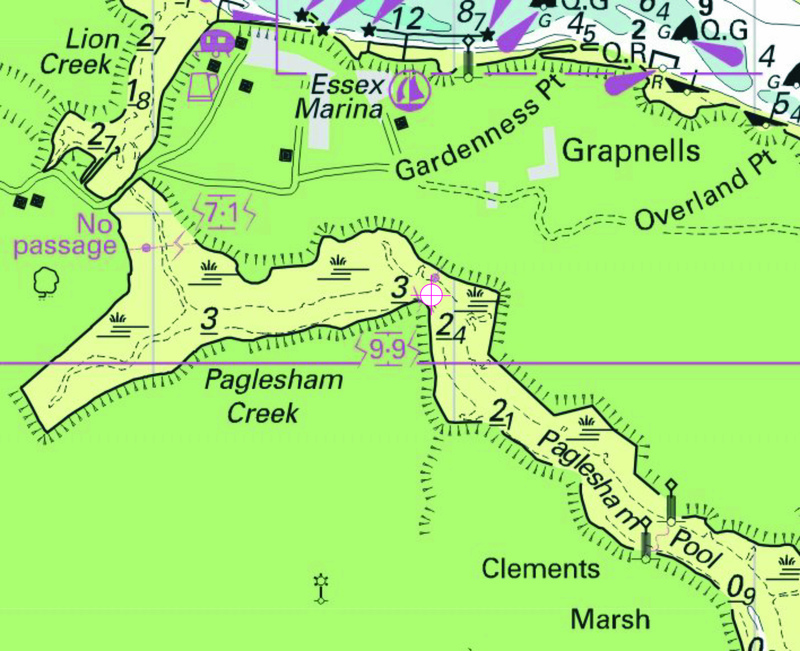 Please ensure that the position is taken into consideration for passage planning and when navigating in this area. 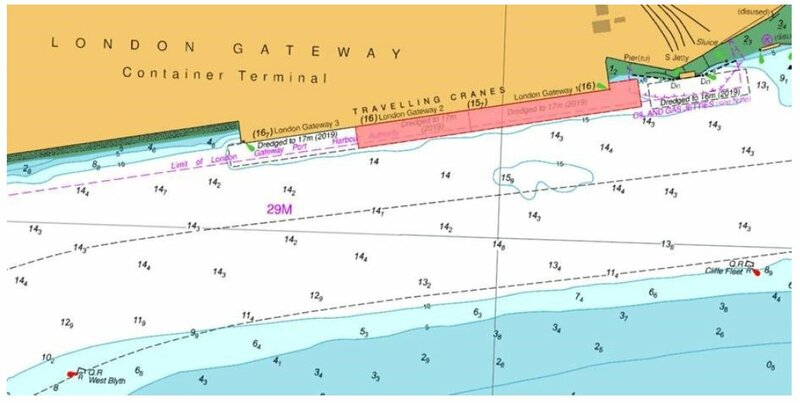 Vessels entering Blakeney Harbour should be aware that there is an East/West sand spit rapidly building between Harbour Entrance Starboard Buoy No. 1 (N 52° 58.897’ E 000° 58.280’ QG) and Harbour Entrance Starboard Buoy No. 2 (N 52°58.867’ E 000° 58.025’ Fl(2)G8s) Vessels entering the harbour should proceed with great caution between these two buoys, heading SE after passing buoy no. 1 before turning SW towards buoy no. 2, in order to avoid shallow breaking water over the new spit. We are anticipating major changes to the harbour entrance channel over the coming few months which we will be closely monitoring. Buoys will be moved to reflect these changes, and confirmed by further Notices to Mariners. Mariners are advised that the Southern Breakwater light (VQ Fl R), located on the end of Southern Breakwater is presently unlit. Please be aware that the Guard Buoys are temporarily removed. Light Long Sand (Middle) Wave Buoy: 51° 40.826’ N 001° 31.229’ E Fl (5) Y 20s 2nm is temporarily removed for service. LAL Knock Deep North Wave Buoy: Light Guard Buoy (North) 51°37.105’ N 001°30.476’ E Guard Buoy (South) 51°37.058' N 001°30.307' E both Fl (5) Y 20s 2nm are temporarily removed. Light Knock Deep (North) 51°37.064’ N 001°30.363’ E Fl (5) Y 20s 2nm is temporarily removed for service. • Crew transfer vessels: Windcat 18, Windcat 21, Windcat 27, Windcat 29, Windcat 36 and Windcat 39 will take offshore technicians to the Offshore Wind Turbine Generators and Offshore Substations for routine operations and maintenance works. 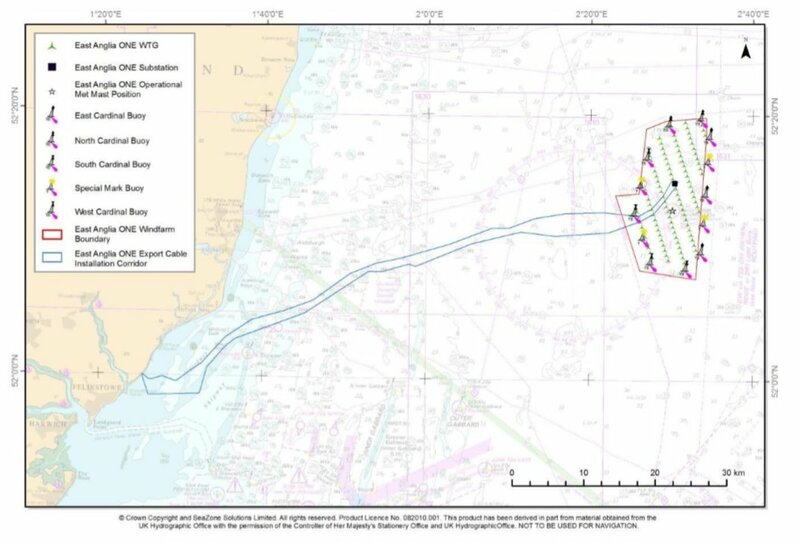 • Survey Vessels Spectrum 1 and Spectrum 2 will be conducting survey ops in and around the windfarm as required. • Jack-up vessel MPI Adventure and the Crew Transfer Vessels Vos Sampson and VOS Trifaldi are on site carrying out blade maintenance at various locations around site along with supporting the MPI Adventure. Please see Notice to Mariners LAL 06/2018 for details. 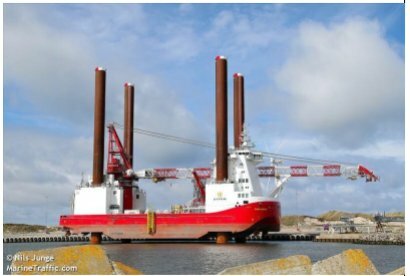 • Crew transfer vessel: MPI Dulcinea and MPI Rucio will take Rope Access technicians to the Offshore Wind Turbine Generators to carry out planned blade repair works at various location around site. • Cable Lay vessel Bokabarge 82 , support vessels Isa , Bommel , Panda ,and crew transfer vessels Avocet , Gardian 3 and Smeaton Array will be on site carrying out various cable repairs where necessary. 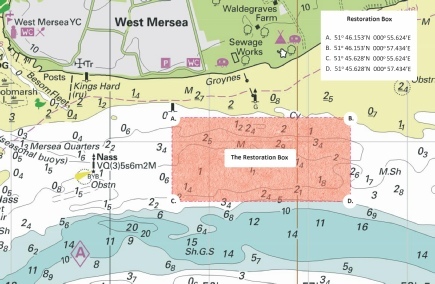 The recovery of the sunken vessel previously reported in position 51° 30.586458N 000°38.728122E in the vicinity of the W Leigh Middle Buoy will commence on 25th March 2019 subject to favourable weather conditions. The wreck will be initially recovered and transferred north to shallower water where it can be fully pumped out in order to refloat. Once afloat it will be towed to Smallgains Creek where it will be lifted out. Recovery will be undertaken using the barge ‘ELLANOR’, with the assistance of the tug ‘SPEEDWELL’. Diving operations in support of the recovery will be carried out from the tug ‘PHOENIX’. All vessels will maintain a listening watch on VHF Channel 68 throughout operations, and a “Proceed with Caution” will be broadcast by London VTS at all times whilst the operation is underway. During diving operations flag code ‘ALPHA’ will be displayed along with flag code ‘ROMEO YANKEE’. The temporary Emergency Wreck Marking Buoy, which currently marks the wreck, will be removed by a PLA Marine Services vessel to ensure the wreck is accessible for recovery. The buoy may need to be reinstated for a time if daylight, tide or weather conditions require the recovery operation to be temporarily halted. Further works on the Tilbury 2 development will commence on the week beginning the 18th March 2019 and will consist of 325m of sheet wall being piled. This will form a new retaining wall as part of the new CMAT berth on the downstream end of the former Tilbury Power Station berth. The piles will be driven into the river bed utilising a 75m flat top barge equipped with a 320T crawler crane to assist with lifting operations. A second flat top barge will be utilised to assist in the storage of materials adjacent to the crane barge. All barge movements will be carried out by the multi-cat vessel SEADOG. A safety boat will also be in attendance. Works are expected to last until early May 2019. On or about 19th March 2019, following a shortened trial period from that previously detailed in NTM M15 of 2019, the light characteristic of the outer lower wing buoy of Greenwich Ship Tier will be returned to a Fixed Blue light as per the charted characteristics. Mariners are advised that the light [Fl(2)G.5s] on the Beach End Buoy has been reinstated. Harwich Haven Authority Notice to Mariners No 13 of 2019 (Beach End Buoy Unlit) is hereby cancelled. On or after the 1st April 2019 the following seasonal recreational marks will be reinstated. NOTICE IS HEREBY GIVEN that due to storm damage, the 2 fixed vertical red navigation lights marking the upstream dolphins on Sheerness berths 4 & 5 are temporarily extinguished. Brightlingsea Harbour Authority will be conducting an annual oil spill response exercise. Exercise ‘November Charlie’ will be taking place on the 20th March, commencing at 0900 UTC and will be complete by 1600 UTC. 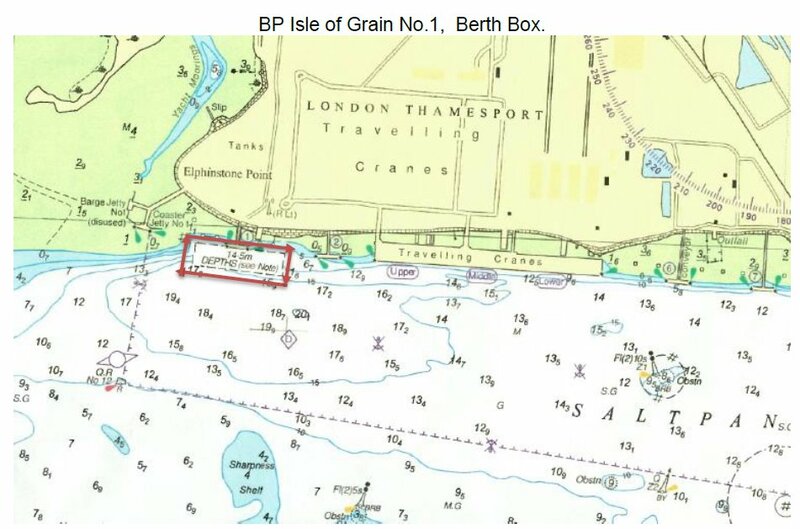 Location of the exercise will be within Brightlingsea Harbour and the main navigational channel leading into Brightlingsea Harbour, not exceeding the south cardinal buoy, ‘Brightlingsea Spit’, at the entrance to the creek. VHF 68 or phone 01206 302200. Brightlingsea Harbour Commissioners Notice to Mariners. Mariners and Port Users are advised that due to essential repairs to the Inner Lock gate Cill, the Wet Dock lock will be closed from 0700hrs Monday 25th March until 1700hrs Friday 29th March 2019. Transit will only be available on a ‘level’ which is approx 90 -120 minutes before High Water. Please contact on VHF Ch 68 or 01473 211066 for the latest information. Every effort will be made to complete the repairs as soon as possible so that normal operations can resume. 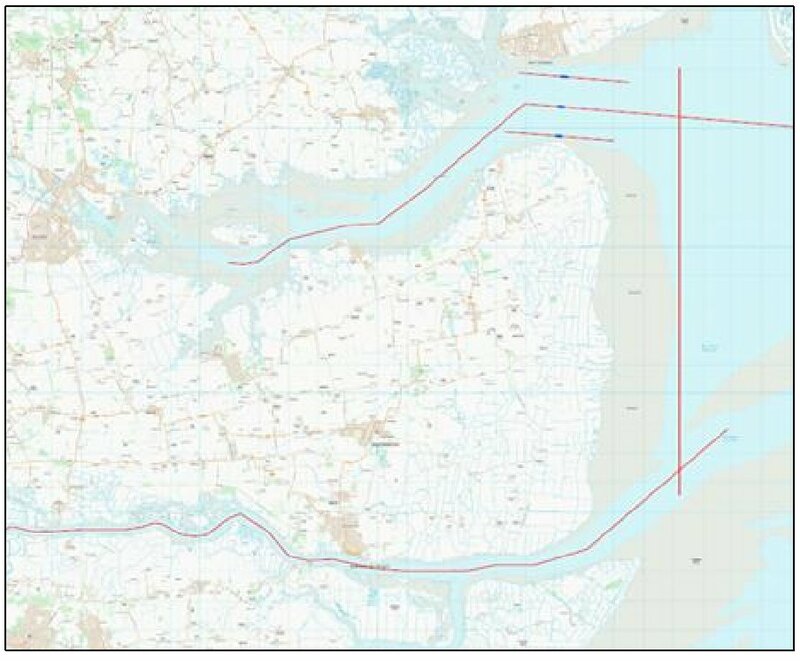 Mariners and Port Users are advised that hydrographic survey operations, off the Norfolk Coast, are scheduled to commence 17th March. These will be conducted using an unmanned surface vessel, operated by ‘XOcean’, which will be remotely controlled by a USV ‘Pilot’. The vessel is capable of working 24/7. The USV has AIS, Navigation lights and a radar reflector. The duration of the survey work is approximately 3 weeks and is subject to favourable weather conditions. 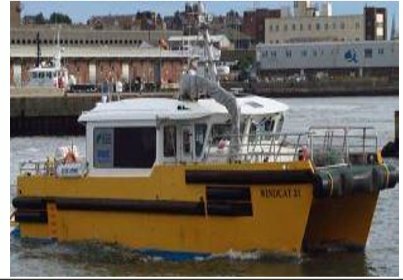 The vessel will transit to and from the survey area from the Royal Norfolk and Suffolk Marina in Lowestoft Outer Harbour area. When transiting Harbour areas the USV will be escorted by RIB Typhoon. The RIB will be monitoring VHF Ch14 during Harbour transits. A copy of the XOcean NTM (with image of the chart area and vessel) is attached with this notice. as a download on the right. On or about 12th March 2019, for a period of approximately two weeks, the light characteristic of the outer lower wing buoy of Greenwich Ship Tier will be changed from the current Fixed Blue light to Isophase Blue 1s. This change is indicated in the chartlet below. 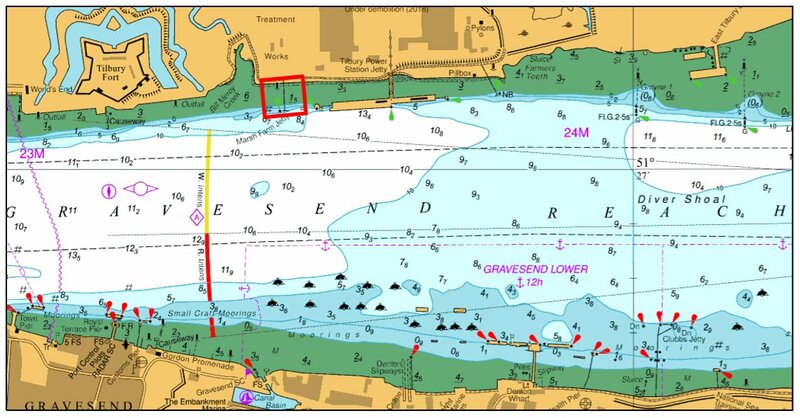 This trial is being undertaken to assess whether an alternative light characteristic will improve visibility of the Greenwich Ship Tier mooring buoys as well as other mooring buoy locations. Reports from vessel masters and operators on the effectiveness of the alternative light characteristic should be made to the Upper District Harbour Master (hmu@pla.co.uk). On or about Tuesday 5th March 2019 a PLA vessel will reposition the South Cardinal Mark at the former Island Jetty to mark the extremity of the work site of the new Royal Wharf Pier. On completion of the installation of piles, the South Cardinal Mark will remain in position until the arrival of the new pontoon. 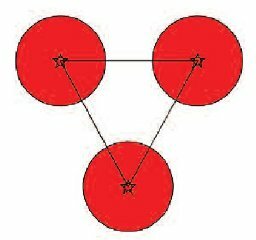 The South Cardinal Mark will display a white light with characteristics Q(6)+LFl.15s. See the chartlet below depicting the new location of the South Cardinal Mark. Diving Operations to carry out underwater examinations of all below water sections. All Diving Operations are programmed to take place over the daytime low water slack periods therefore span closures will not be required. The dive support and safety boat “Dentex III” will be in attendance and will maintain a listening watch on VHF Channel 74. She will display the International Code of Signals Flag “A” at all times that divers are in the water. All activity on the Range is conducted in a strictly controlled environment and presents no danger to the public. This work, as with the vast majority of work undertaken on the site, is subject to suitable acoustic forecasts and tide times, which are governed by weather conditions on the day. Consequently, the date of the activity may be subject to change. If members of the public are concerned by Range activity, they can call the freephone Careline on 0800 0560108. Notice is hereby given that dredging operations are programmed to commence from Monday 15 April until Friday 30 August 2019, during the hours of 0800 hours and 1600 hours daily, excluding weekends. The works may restrict the access passage of vessels from the north of Stanley Carr to the A146 over Bridge. The navigation will remain open but mariners must exercise great care whilst proceeding past the works. All equipment will be lit and signage will be in place to warn of restrictions and delays. 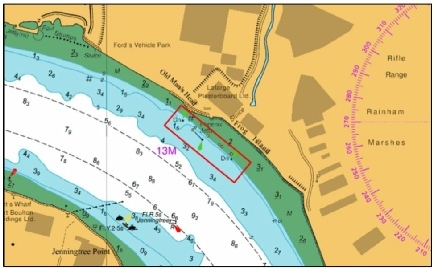 Notice is hereby given that marine contractors will be carrying out replacement work to the moorings adjacent to ‘Waterside’ – 200m downstream of St. Olaves Bridge - Between Monday 18 March and Monday 1 April 2019. Where the works are being undertaken the channel may be restricted. The navigation will remain open but boaters must exercise great care whilst proceeding past the works. TM456996 please ensure that the new position is taken into consideration for passage planning and when navigating in this area. 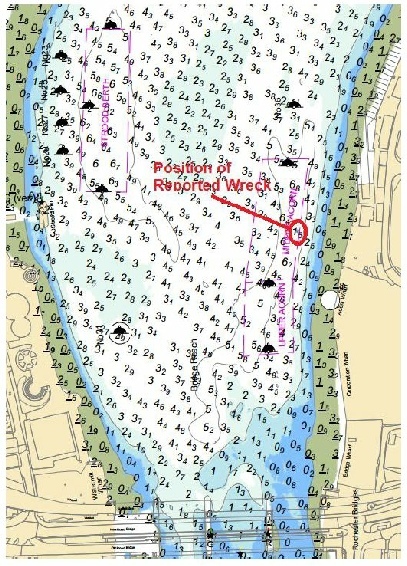 The recovery of the sunken vessel previously reported in position 51° 30.586458N 000°38.728122E in the vicinity of the W Leigh Middle Buoy will commence on 11th March 2019 subject to favourable weather conditions. On Friday 1st March 2019 work will commence to erect temporary under-slung scaffolding works on Jetty No. 2 at Navigator Terminals. Once in place strengthening work will take place to the existing steel structure. The temporary works will not impinge the face of the berth and there will be no restrictions to vessels berthing and mooring operations. Works are due to be completed by 30th April 2019. On or after the 1st March 2019 the following seasonal recreational mark will be established. Harwich Shelf East Cardinal Buoy - 51°56’.84N 001°18’07E . 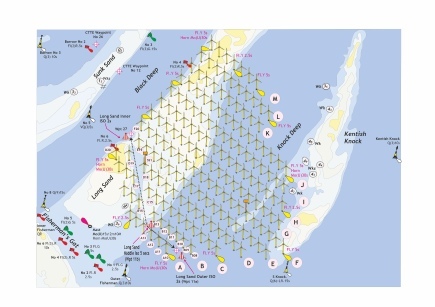 For week commencing 11th March 2019, the “Kari Hege” will be engaged in dredging operations in the main channel North of number 10 buoy, between buoys 10 & 2 and the Outer Harbour. Vessels entering or exiting the harbour should call the “Kari Hege” when working, on channel 12 or harbour staff if it’s not working. All pre-arranged dredging areas are constrained by the weather and wave heights therefore operations are subject to change on a daily basis. 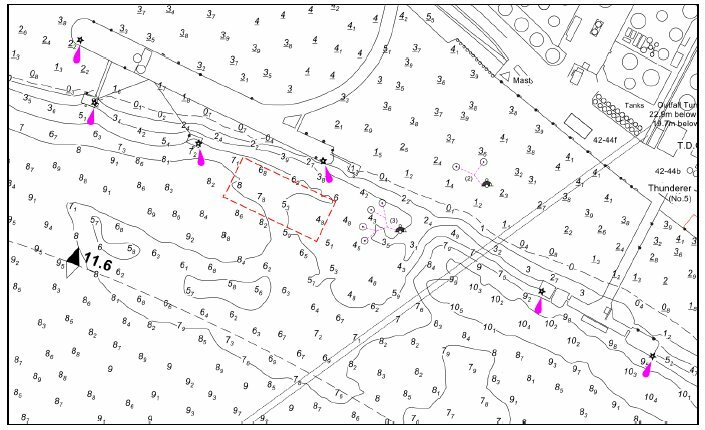 Starting on 24th February 2019 survey works will be carried out along the River Thames between Tower Bridge and Shornmead Light. The survey will be carried out by a PLA Survey vessel which will deploy subsurface towed equipment up to 200m astern of the vessel. When carrying out the survey the PLA Survey vessel will be restricted in its ability to manoeuvre and will display lights and shapes in accordance with the International Regulations for Preventing Collisions at Sea 1972 (as amended) Rule 27 b. The vessels will maintain a listening watch on the appropriate port VHF working channel throughout the working period. All vessels are required to proceed with caution past the survey vessel when work is underway and at all times when advised by London VTS. The latest survey position will be updated by London VTS through the routine broadcasts made on the appropriate port VHF working channel. Survey work is due to be completed by 1st March 2019 but this may be extended as a result of prolonged periods of unsuitable weather or other operational requirements. This notice will be cancelled on completion of the surveys. On Tuesday 26th February at approximately 18:00 the Northfleet Upper Light will be switched over from its current location on top of the tower block (adjacent to Bevans 42) to the new PLA Radar Tower that has been constructed adjacent to the tower block. During the switch over there may be times when the light is not exhibited but this is expected to be only momentarily. London VTS will broadcast messages on VHF Channel 68 prior to any changes and confirm once all work is complete. Contractors working on the TILBURY 2 development will carry out UXO surveys off the former Tilbury Power Station Jetty in Gravesend Reach. Starting the week commencing 25th February the flattop barge NEPTUNE will be positioned at various locations within the UXO investigation area shown above from which diving operations will be carried out with the assistance of a barge mounted long arm reach excavator. Barge set-up and positioning will be supported by MPV SEADOG which will remain in attendance throughout diving activities. During the diver operations flag code ‘ALPHA’ will be displayed along with flag code ‘ROMEO YANKEE’ in conjunction with a broadcast “Proceed with Caution” request by London VTS at all times diving operations are underway. No vessel other than those engaged in the surveys will be permitted to enter the UXO Investigation Area. Survey works are expected to be completed by 10th March 2019.
have been removed from site. 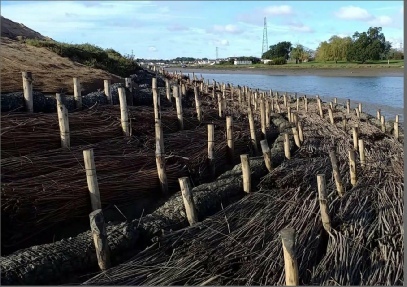 Mariners are advised that survey works will commence on the river Crouch on Friday 1st March 2019. The survey will be carried out by PLA Survey Vessel MAPLIN which will maintain a listening watch on VHF channels 11 and 16. 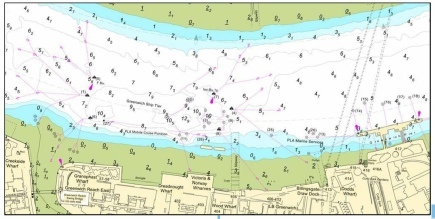 Starting on Friday 1st March 2019 survey works will be carried out along the River Crouch, Dengie Flats/Ray Sand and the River Blackwater. On the Crouch the survey extends from Brandy Hole Reach in the West to the Buxey Sand in the East. 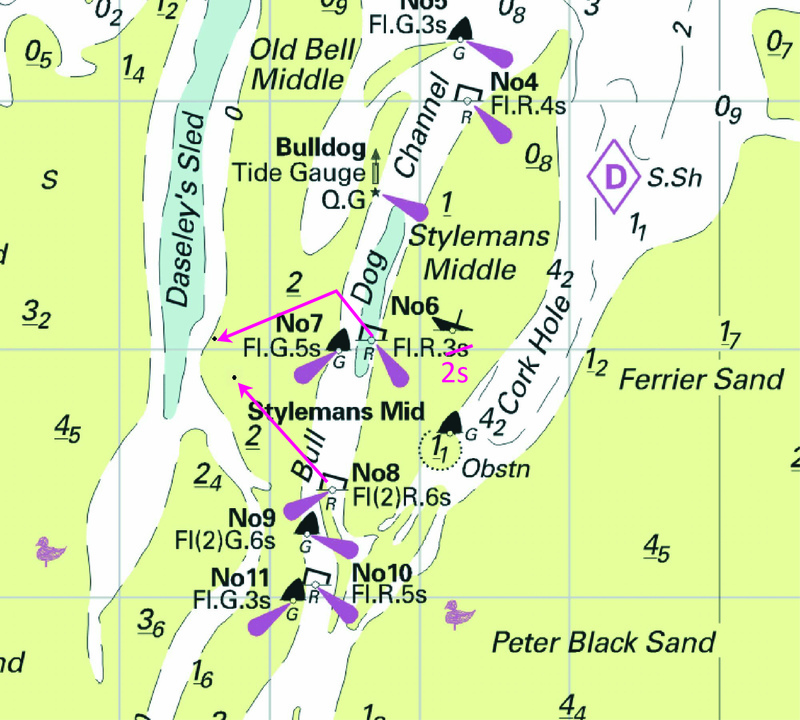 On the Blackwater the survey extends from Osea island in the West to Colne Bar in the East. The survey will be carried out by PLA Survey Vessel “MAPLIN” which will deploy subsurface towed equipment up to 200m astern of the vessel which will be marked with a tail buoy. When carrying out the survey the PLA Survey vessel will be restricted in its ability to manoeuvre and will display lights and shapes in accordance with the International Regulations for Preventing Collisions at Sea 1972 (as amended) Rule 27 b. The vessels will maintain a listening watch on the appropriate port VHF working channel throughout the working period. All vessels are required to proceed with caution past the survey vessel when work is underway and at all times when advised by Crouch Harbour Authority. Survey work is due to be completed by 10th March 2019 but this may be extended as a result of prolonged periods of unsuitable weather or other operational requirements. This notice will be cancelled on completion of the surveys. is out of the water for maintenance. We will advise when it is back on station. Please be advised that the Brightlingsea town pontoon will be having some maintenance carried out upon it. 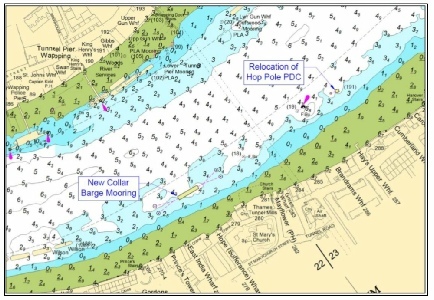 This means there will be periods when the hammer head section will not be connected to the pontoon, between the period of the 18th to the 28th Feb. Vessels are advised to call the harbour on VHF channel 68, to confirm that the hammer head can be used prior to landing. For further information, please contact Brightlingsea Harbour. 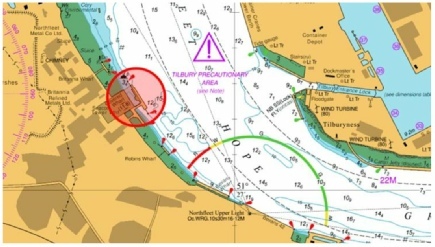 Mariners and River Users are advised that the following IALA approved Navigation Lights are now in operation at the Ipswich Tidal Barrier in the new Cut. On the Western side marking the Northern and Southern ends of the Barrier we have two pairs of all round Red lamps located 2m above MHWS. There are two pairs of Green Lights marking the Eastern side of the Barrier North and South. When the Barrier is raised and closed for Navigation, this is marked by 3 red Lights in a vertical line one set at the Southern side and another set at the Northern side of the Barrier. These lights are illuminated as soon as the barrier starts to move. The official opening of the Tidal Barrier is scheduled for Friday 8th February 2019. Harbour Master 5th February 2019. Urgent update to all Mariners. Notice is hereby given that major maintenance works to Mutford Lock road bridge are being undertaken by Suffolk Highways from Monday 11 until Friday 22 March 2019. The road bridge will not be able to be raised for the duration of the works and Mutford Lock will also be closed to navigation from Monday 11 until Friday 15 March 2019. Clearance for vessels using Mutford Lock from Saturday 16 until Friday 22 March 2019 will be restricted to 2.4m at mean high water and 4.2m at mean low water springs. After maintenance works are completed, Mutford Lock will be opening on normal winter hours between 8am-12pm during this time. For further details contact Oulton Broad Yacht Station on 01502 574946. • The MPI Adventure will move from WTG to WTG, spending approximately 36-48 hours at each location. When located at a WTG, a 500m radius exclusion zone will be put in place centered on the MPI Adventure. 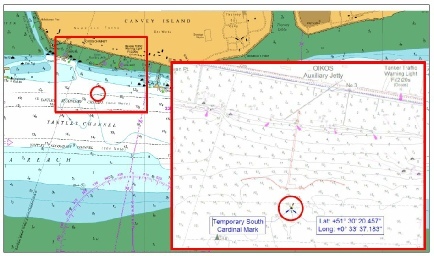 Mariners are advised that between 22:00 hrs on Monday 4th February 2019 and 02:00 hrs on Tuesday 05th February 2019 the remaining pipeline moored on the temporary mooring installation in the River Stour (Reference Notice to Mariners No 17 of 2018) will be taken off the temporary mooring and towed to sea. Mariners are reminded that the pipeline is approximately one kilometre in length. Traffic management restrictions will apply during the towage operation. 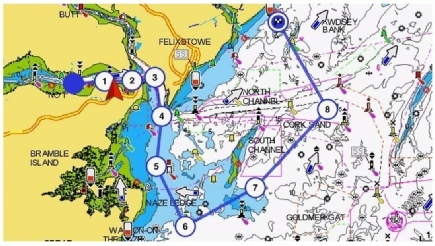 All vessels must declare their intention to navigate between the temporary moorings in the River Stour and Landguard Point to Harwich VTS between 21:30 hrs on Monday 4th February 20219 and 01:00 hrs on Tuesday 5th February 2019 via VHF channel 71 or telephone 01255 243000. 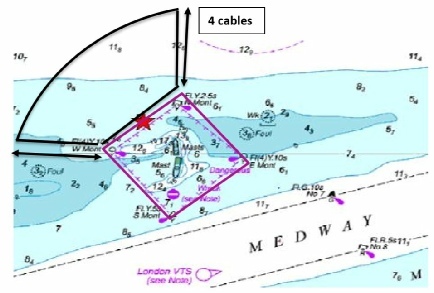 Details of the operation can be obtained from Harwich VTS on VHF channel 71. The following vessels will be involved in the towage operation: Duke of Normandy, Forth Warrior, and the Celtic Guardian. 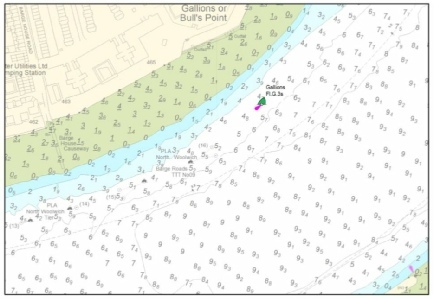 The temporary moorings in the River Stour (Reference Notice to Mariners No 17 of 2018) should be removed from the site by the 9th of February 2019. Notice to Mariner No.5 of 2019 is cancelled. Works will commence on Monday 4th February 2019 on refurbishment of timber fenders on the main jetty at Tower Wharf. The spudleg barge, GPS BOXER, will be positioned on the outside of the jetty during the works and a ‘Proceed with Caution’ will be broadcasted by London VTS on VHF Channel 68. Works will be managed around shipping movements at which time all marine craft will be clear of the berth. The safety boat, MOLLY G, will be on site throughout the works and will be maintaining a listening watch on VHF Channel 68. The tug, HORTON, will be in attendance when required to reposition the GPS BOXER as the works progress along the wharf. Works are expected to last 8 weeks. NOTICE IS HEREBY GIVEN that from 19th January 2019 to 28th February 2019, EGS International Ltd. will be undertaking, on behalf of the MCA and Receiver of Wreck, a detailed sonar survey of the SS Richard Montgomery wreck and have obtained permission to enter the prohibited area. All survey work will be carried out by the EGS Watchful (callsign MAQK4; MMSI 232006596; fitted with AIS Class A) who will be keeping a listening watch on VHF Channels 16 & 74. 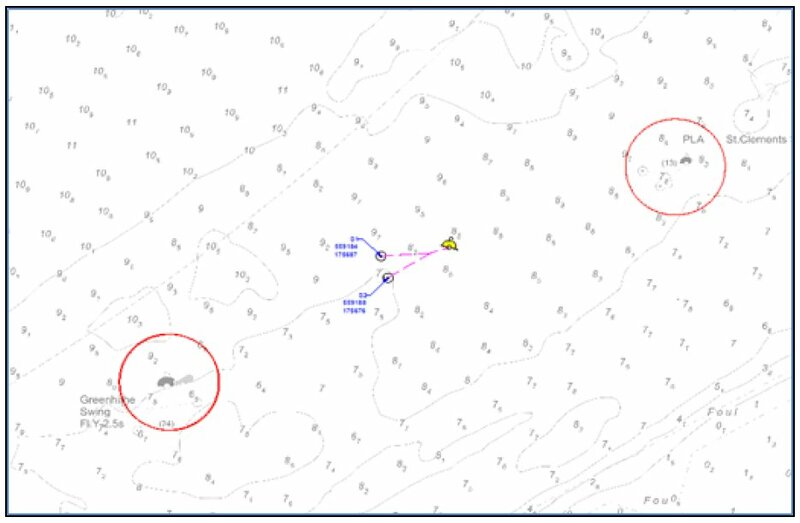 As part of the survey, EGS Watchful will also be operating within the restricted sector to survey and check the oceanographic recording equipment that is located on the seabed just outside the Wreck Exclusion Zone in position 51° 28.086’N 000° 46.914’E. Mariners are reminded this equipment consists of a seabed Lander marked by 3 red buoys and remains deployed NW of the Wreck Exclusion Zone until 1st June 2019. 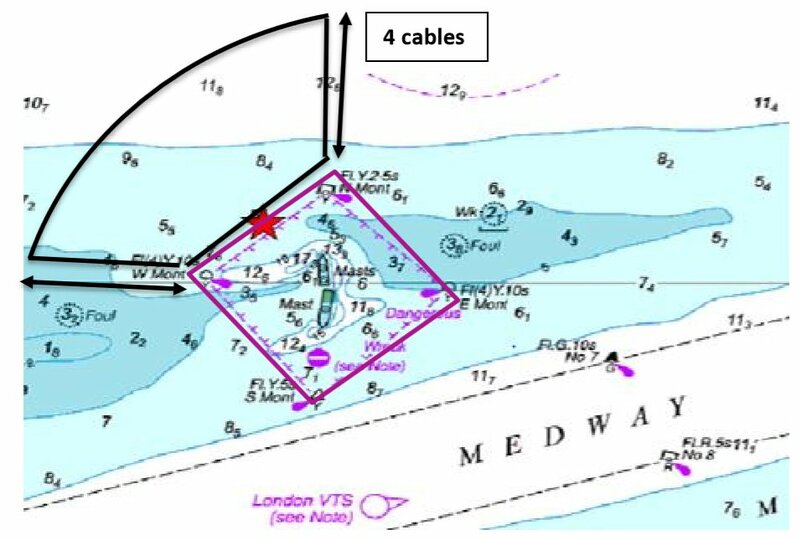 All mariners are requested to keep a minimum of 4 cables clear by navigating outside the area bounded by the sector marked above based on Admiralty chart 3683 – Sheerness and Approaches. They should also be mindful that due to the nature of her work, EGS Watchful is restricted in her ability to manoeuvre as required by the Rules and is therefore unable to keep out of the way of other vessels. Mariners are advised to slow down, maintain a listening watch on VHF Channel 74 and navigate with caution keeping well clear when passing. Further information can be obtained from Medway VTS on VHF Channel 74 (Callsign “Medway VTS”) or telephone 0151 949 6148 or 0151 949 6650. Work to re-build and replace the faulty component is progressing but is not yet complete. The contractor will be providing a progress update next week when we will issue further details. Marking Buoy has been placed to warn mariners. Attempts to recover the vessel will be carried out as soon as possible. Mariners are advised that on or about the 26th January 2019 the dredger Sospan Dau will commence maintenance dredging in the harbour, for a period of approximately 4 days. Materials will be disposed of to the beneficial sites in the River Stour and River Orwell. Mariners are advised that the Felixstowe Waverider Buoy, in charted position 51°56'.30 N, 001°23'.64 E is unlit and out of position. Monday 28th January – Pontoon disconnected from shore access ramps and moorings then moved alongside Waveney No.2 berth. Tuesday 29th January – Pontoon furniture and fittings removed then pontoon towed to Lay By berth at Shell Quay, Inner Harbour. Works will involve crane operations – lifting heavy structures, also works from a suspended basket. Vessel ‘Jumbo’ will assist in these works and will tow the pontoons to the lay by berth on completion of the pontoon de-mob. Vessels are requested to transit Waveney Dock at slow speed and to not to pass close to the works area to minimise affects of vessel wash. The works are subject to favourable weather conditions and timings may vary. Mariners are advised that the issue with No. 1 Ramsgate Approach buoy has been resolved and is now lit. 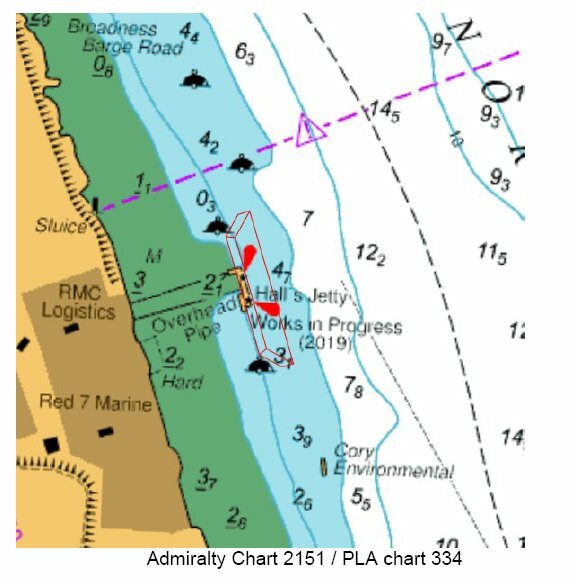 Mariners and Port Users are advised of an area of suspected shoaling approx. 350 metres East of Lowestoft Harbour entrance, centred on approx. position 52˚ 28.260’N, 001˚ 45.700’E. This shoaling has yet to be confirmed, but may have resulted in depth reduction of between 0.5m and 1.0m. 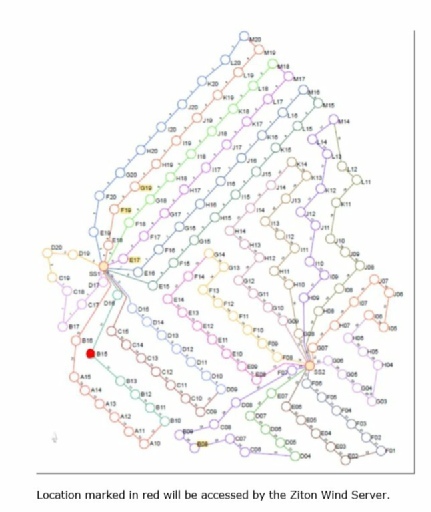 This area is shown on the chart extract opposite. 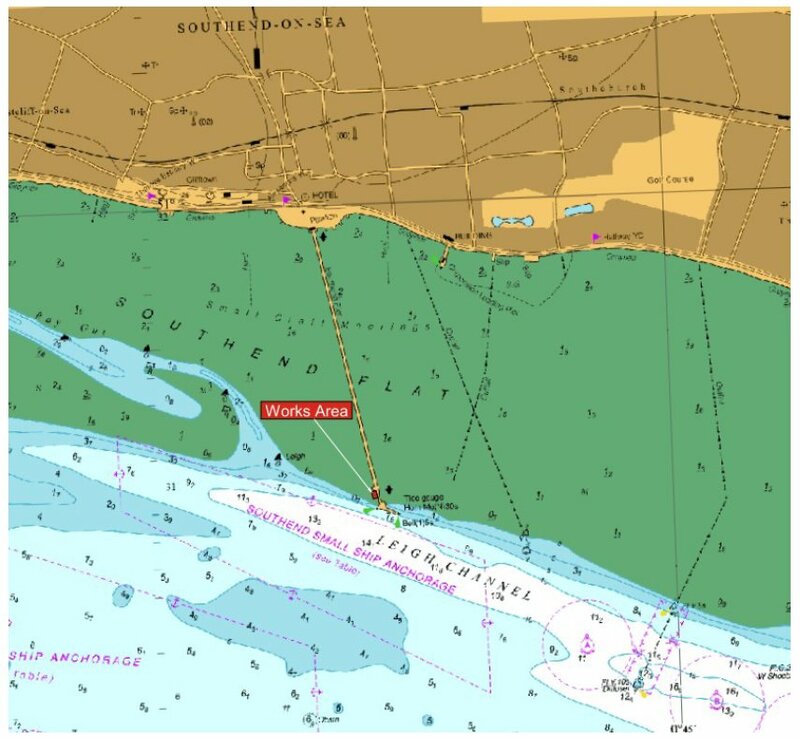 Mariners and Navigators are requested to navigate with caution when in Lowestoft Harbour approaches, using all means available to check and verify vessel position to ensure that the required under keel clearance is available. The area of concern would appear to be within the occulting red sector of the port entry light. This light is an aid to navigation but should not be solely relied upon for an indication of vessel position. A survey of this area will be arranged to verify depths. The results of this survey will be promulgated once available. Mariners are advised that inspections and investigations are to be carried out on the A47 Bridge that crosses the River Great Ouse at King’s Lynn on the following dates and times.  Phase 1, 31-01-19, 1 overnight shift 2000hrs to 0600hrs.  Phase 2, W/C 25-02-19, 3 weeks, overnight shifts, 2000hrs to 0600hrs, Mon to Fri only. An under bridge inspection platform will be deployed for these operations which will be fully illuminated and can be manoeuvred to allow passage if required. A dedicated lookout will be on the platform to maintain a safe watch for any marine traffic. KING'S LYNN CONSERVANCY BOARD Notice to Mariners No. 6 of 2019. 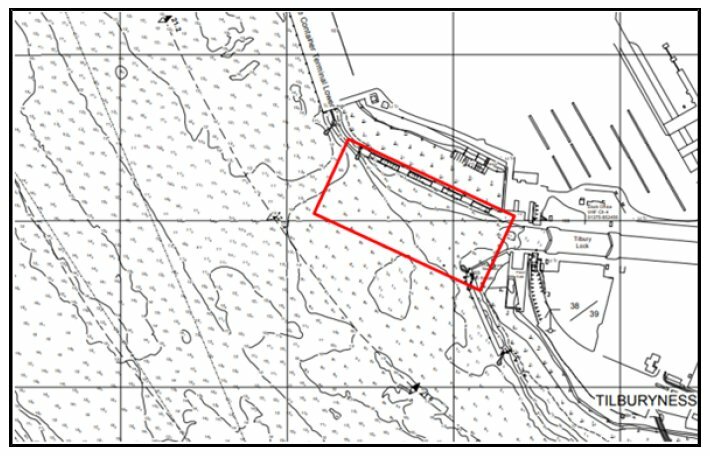 The Split hopper Barges will be depositing material in the disposition area in Buttermans Bay & Long Reach (TH 034) in accordance with their own Marine Licenses issued by the Marine Management Organisation. 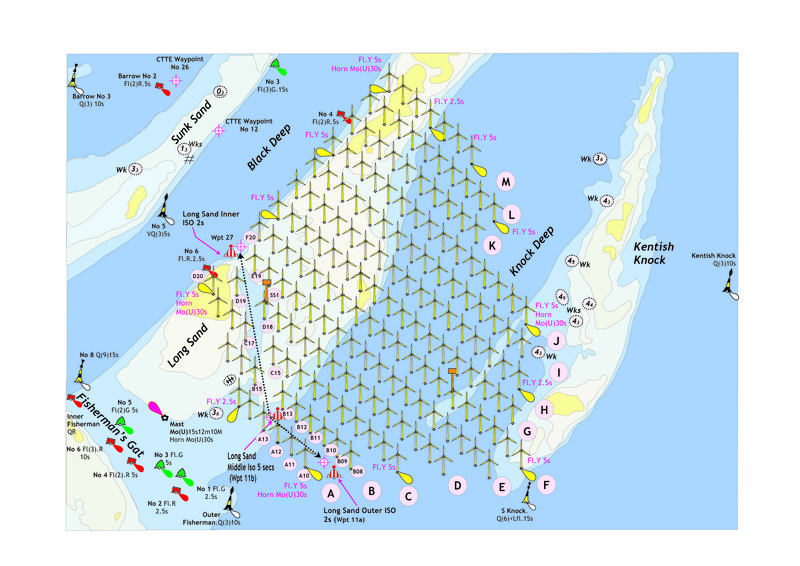 All vessels will be monitoring VHF Channel 68 and showing International Signals for a vessel engaged in Dredging. Notice is hereby given that dredging operations are programmed to commence from Monday 4 February until Friday 31 May 2019, during the hours of 0800 hours and 1600 hours daily, excluding weekends. The works may restrict access to South Walsham Broad via Fleet Dyke and the passage of vessels from the south of Acle Bridge (Marsh Farm) to ‘Oby Mill’. The navigation will remain open but mariners must exercise great care whilst proceeding past the works. All equipment will be lit and signage will be in place to warn of restrictions and delays. w/c 31 st December for 4 weeks. Vessels are requested to pass at low speed. Starting on 8th January 2019 works will commence on the replacement of the inner dolphin on the downstream end of the Tilbury Landing Stage. The works will be carried out from the jackup barge COMMANDER which will be positioned on the end of the stage. The works will see the removal of the current structure and replacement with a new dolphin structure. The works involve lifting and piling operations. A safety boat will be in attendance throughout the works. NOTICE IS HEREBY GIVEN that the sunken floating dock/converted barge, that has been moored to a large yellow mooring buoy to the north of the Lower Halstow Yacht Moorings has now been refloated. 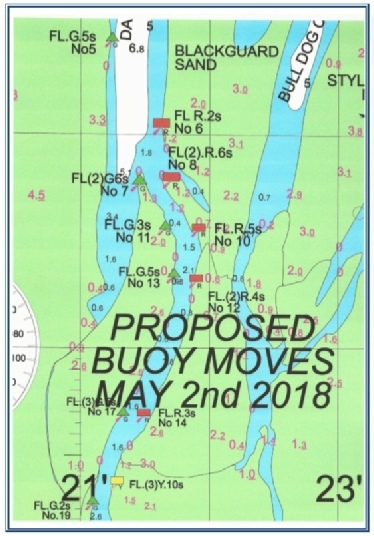 Further information may be obtained from Medway Navigation Service (VTS) on VHF Channel 74 (call sign “Medway VTS”) or telephone 0151 949 6656. 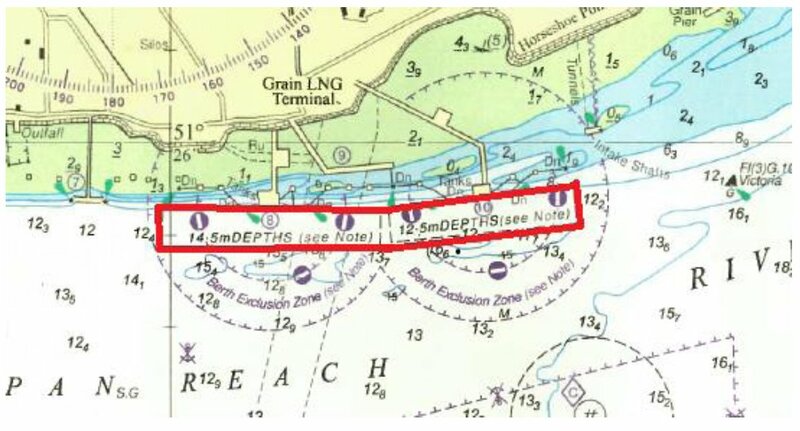 NOTICE IS HEREBY GIVEN that mariners are to observe the exclusion zones in relation to the Isle of Grain LNG Terminal Jetties Nos.8 & 10 in Saltpan Reach. Mariners are also to note that any unauthorised infringement of the LNG Exclusion Zones may result in prosecution. 2. Whilst an LNG vessel is moored at the LNG Terminal no vessel greater than 50 metres LOA, other than service craft attending the LNG vessel which are authorised by the Harbour Master or the operator of the LNG Terminal, shall enter any part of the River Medway which is within an arc measuring 250 metres in any direction from the cargo transfer arms of the LNG Terminal (‘the Berth Exclusion Zone’) or pass the Berth Exclusion Zone at a speed greater than 7.5 knots through the water. Further information may be obtained from Medway VTS on VHF Channel 74, call sign “Medway VTS’ or telephone 0151 949 6148 or 0151 949 6650. Reports received have identified the obstruction as being near to the shore line and being submerged over mid to high tide times. Further information may be obtained from Medway Navigation Service (VTS) on VHF Channel 74 call sign “Medway VTS’ or direct on telephone no. 01795 663025. 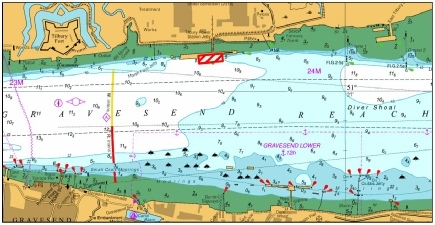 • When an inward bound vessel of more than 130 metres Length Overall is underway in the buoyed channel between the Medway Buoy and Darnett ness the lights are exhibited in an upriver direction. • When an outward bound vessel of more than 130 metres Length Overall is underway in the buoyed channel between Darnett Ness and the Medway Buoy the lights are exhibited in a seaward direction. Medway VTS operate a Traffic Organisation Service and will continue to notify mariners of vessel movements. NOTICE REMAINS IN FORCE that, due to the exceptional high tides experienced November 2017 a vessel has been stranded in the upper reaches of Faversham Creek. The vessel ‘Revenge’ is firmly aground in the vicinity of the Sewage Treatment Works on the east side. The vessel has settled with a heavy list towards the middle of the creek. In 2018 the masts were removed as they were causing an obstruction to the navigable channel. She was subsequently set on fire and remains in the same position as a metal frame wreck. Vessels should pass with extreme caution. Salvage operations will be taking place. Further information may be obtained from Medway VTS on VHF Channel 74, call sign “Medway VTS’ or telephone 0151 949 6148 or 0156. A minimum depth of 1.5m at Chart Datum has been recorded. Mariners are advised to keep clear and navigate with caution In this area. Please contact Lowestoft Port Control, VHF Ch14, Tel. 01502 572286, if additional information is required. Vessels entering Blakeney Harbour should note that CHANNEL MARKER STARBOARD BUOY 13 is temporarily ‘off station’ until further notice. KING'S LYNN CONSERVANCY BOARD Notice to Mariners No. 05 of 2019. 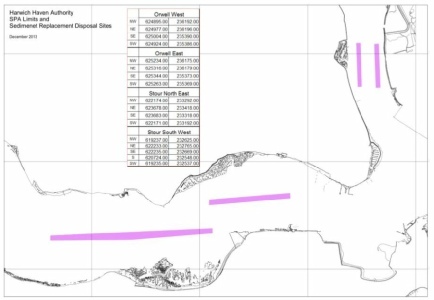 Notice is hereby given that contractors working on behalf of Magnox Limited will commence preparation work in connection with surface water pipelines from the East culvert adjacent to the Magnox Bradwell site to the outfall structure. Once the pipeline work has been completed, the works will be flushed using clean water to remove any silt (to a maximum of .1m3 in volume). This work is commensurate with the application made to the MMO in respect of the above licences and is likely to take less than one week to complete. Dependant on weather. 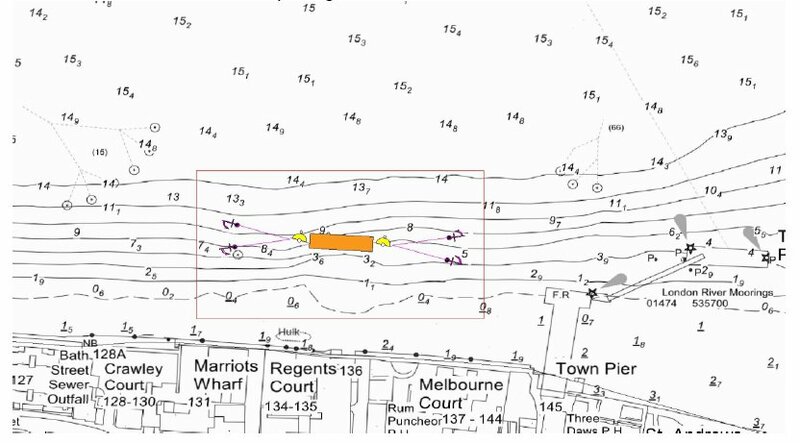 Mariners are advised that on the 28th December 2018 a PLA Driftwood vessel will position a South Cardinal Mark off the piles at the deconstructed Island Jetty. The South Cardinal Mark will display a white light with characteristics Q(6)+LFl.15s. See the chartlet opposite depicting the location of the South Cardinal Mark. Mariners and Port-Users are advised the waiting pontoon in the east end of the Trawl Dock is out of action and cannot be used by any vessels until further notice. Any yachts or small craft who require a berth to wait for a bridge opening are advised to contact the Royal Norfolk and Suffolk Yacht club on VHF Ch. 80 or by phone on 01502 566726. "As you are already aware during this month’s maintenance inspection, our contractor identified a fault with the hydraulic mechanism of the bridge which prevents the bridge from closing fully after lifting and therefore, compromises the use of the roadway. Our contractor is currently sourcing a replacement component and will now be back on site w/c 31 December. We apologise for the inconvenience that this will cause with the bridge being closed to marine traffic during the holiday period and we will notify you of progress sometime during that week." 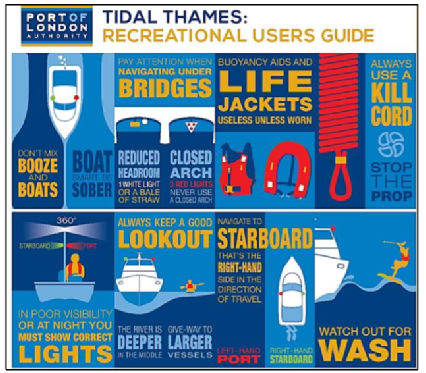 The Port of London Authority (PLA) has recently published a revised and updated Recreational Users Guide aimed at leisure users in the Port of London. The revised guide includes; updates to Port buoyage, general improvements to the wording and layout. As such, this now supersedes all previous versions, which are no longer valid. Therefore, any remaining copies should be withdrawn. Copies of the new Recreational Users Guide are being distributed to all Tidal Thames Navigators’ Club (TTNC) members and should be received shortly. Please visit our leisure user’s website – www.boatingonthethames.co.uk – to enquire about joining the TTNC. Copies of the guide are available free of charge by contacting our TTNC Administrators by emailing: TTNC@pla.co.uk, although the PLA reserves the right to charge for orders greater than six copies. The Recreational Users Guide is also free to download from both: www.pla.co.uk – (Safety Tab – Regulations and Guidance) and www.boatingonthethames.co.uk, along with copies of the PLA Thames Byelaws, General Directions and other Codes of Practices, which can be printed or saved onto mobile devices. Mariners and Port Users are advised that due to essential works on behalf of ABP and the Environment Agency , Ipswich Lock will be closed for all vessels during the following period : Thursday 20th December from 2230hrs ~ 0630hrs Friday 21st. There is a possibility that works could be completed earlier than expected, please contact Orwell Navigation Service on VHF CH 68 for the latest information. Notice is hereby given that BAM Nuttall will be carrying out repair work to the gabion baskets in the ‘Haddiscoe Cut/New Cut’ between 7 January 2018 and 5 April 2019. Where works are being undertaken the channel will be restricted to 10 metres. The navigation will remain open but boaters must exercise great care whilst proceeding past the works. Any vessels requiring greater width to navigate safely must notify Broads Control in advance on 01603 756056 to arrange for passage during this time. TG434007. Please ensure that the new position is taken into consideration for passage planning and when navigating in this area. Please be advised that Burnham Yacht Harbour Marina Ltd will be undertaking their Annual Maintenance Dredging Operations in the approach to and within Burnham Yacht Harbour, Burnham on Crouch, Essex, between approximately 15th December 2018 and 31st May 2019. Mariners and Port-Users are advised that the information note for ‘Port Safety and Environmental Notice for Master’ using Lowestoft Harbour has been revised and is attached to this notice. This revision precedes all previous revisions. The new revision mainly effects the below areas; Firstly, ‘Section 10: Lifting operations’ has been added in this revision to provide a reference on how to gain authorisation for the use of mobile cranes on the port estate/quayside areas. Secondly, ‘Section 13 Personal Protective Equipment (PPE)’ has been updated as the port is enhancing its requirement for PPE to be worn when walking within the Port Estate to join / leave a vessel. This includes, Town Quay, Talismans Quay, Silo Quay, All North Quays and Shell Quay. All crew/personnel must wear the minimum PPE requirement of safety helmet and high visibility vest. There will also be a yellow plastic waterproof box at the gated entrance to North Quay and Town Quay (see attached diagram) to deposit the PPE when leaving the port estate, or to collect the PPE when entering the port estate. Boxes will be labelled “SHIPS CREW PPE”. Thirdly, ‘Section -14 Fresh water’ has been added to inform vessels of the recently implemented changes for the supply of fresh water. 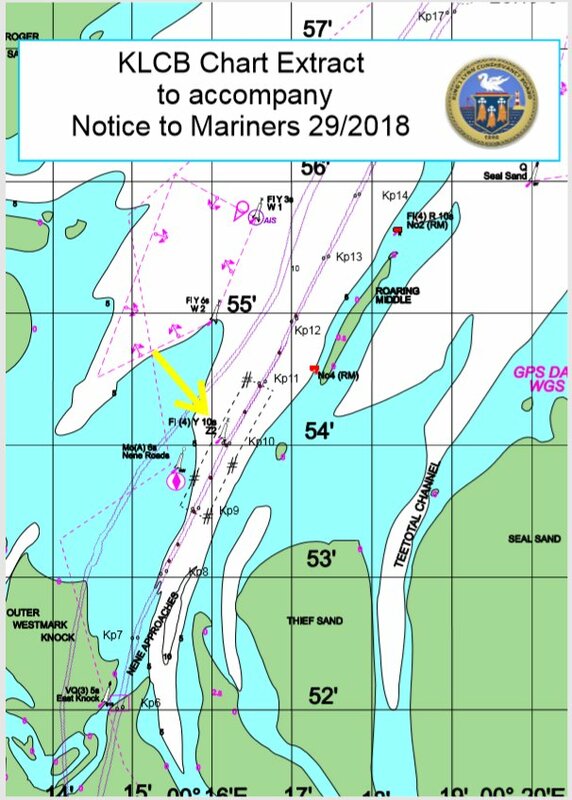 Please bring this notice and the revision of the information to the attention of all Mariners and Port-Users operating in this area. 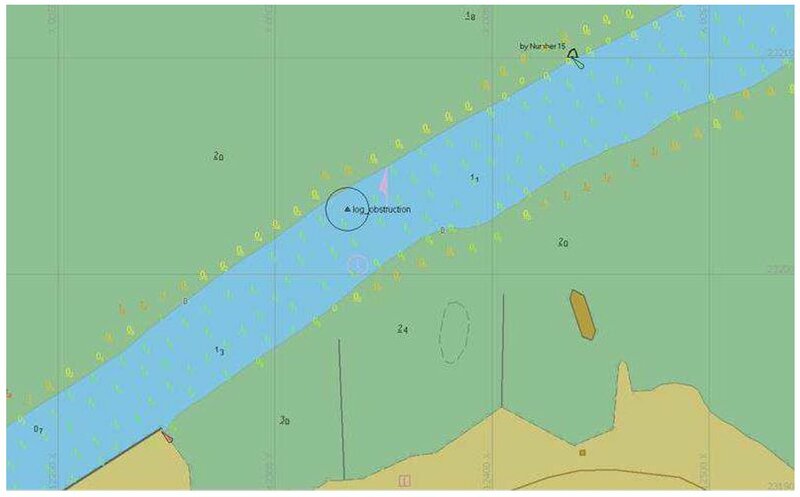 For week commencing 7th January 2019, the “Kari Hege” will be engaged in dredging operations in the main channel North of number 8 buoy, between buoys 8 & 4. Vessels entering or exiting the harbour should call the “Kari Hege” when working, on channel 12 or harbour staff if it’s not working. 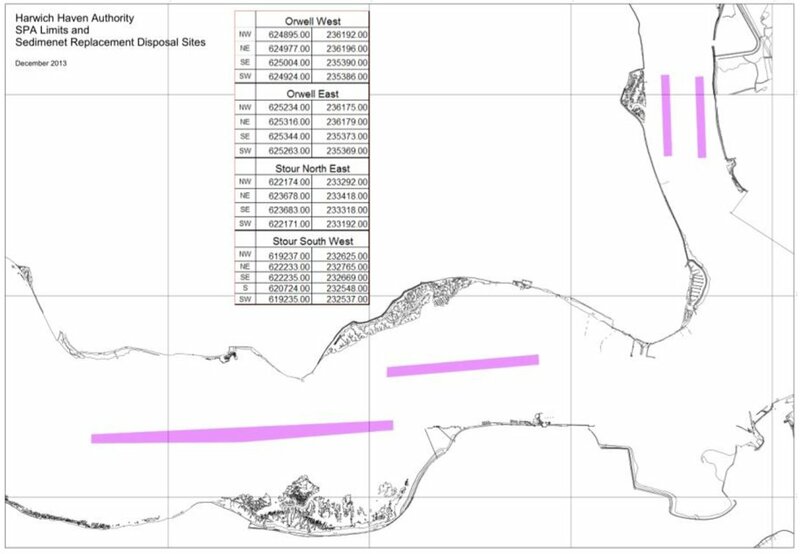 All pre-arranged dredging areas are constrained by the weather and wave heights therefore operations are subject to change on a daily basis. For further information please contact King’s Lynn Harbour Radio on VHF 14. KING'S LYNN CONSERVANCY BOARD Notice to Mariners No. 29 of 2018. Please be advised that the Ziton Wind Server, on behalf of Siemens Gamesa Renewables A/S, will be commencing four major component exchanges within the London Array wind farm from the 11th December 2018. The Ziton Wind Server jack-up vessel is 79.3m long and has a breadth of 32.3m, and has a gross tonnage 6567 tonnes. It will jack at the following location within London Array to conduct major component exchange. The Ziton Wind Server will be supported by designated crew transfer vessel Windcat 21. The CTV will operate out of Ramsgate, and transport personnel to and from the vessel and access the WTGs. A 500m radius restricted zone will be put in place centered on the Ziton Wind Server when this is located at B15 WTG. 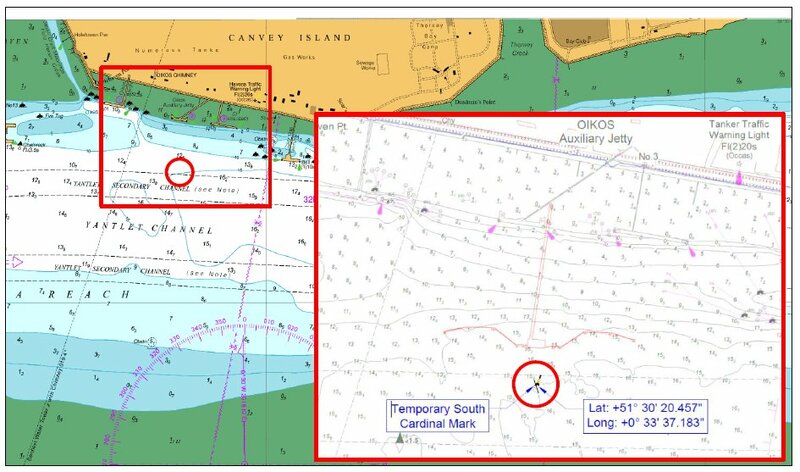 If access is required to this zone for non-project traffic, authorisation must be requested from the London Array Marine Coordinator before entry. This may well have closed Foulger's Gat temporarily. The Gat is approximately 1000 metres wide so in theory a 500 metre exclusion zone. will not have closed the Gat. It would be prudent to call up the Windcat 21 early. Mariners are advised that the previously reported object on the seabed has now been cleared from the navigational channel. It is now located 5m outside the buoy line with coordinates 51° 56.9185’ N, 001° 18.1985’ E (WGS 84). The minimum available depth above this object is 12.6m below chart datum. 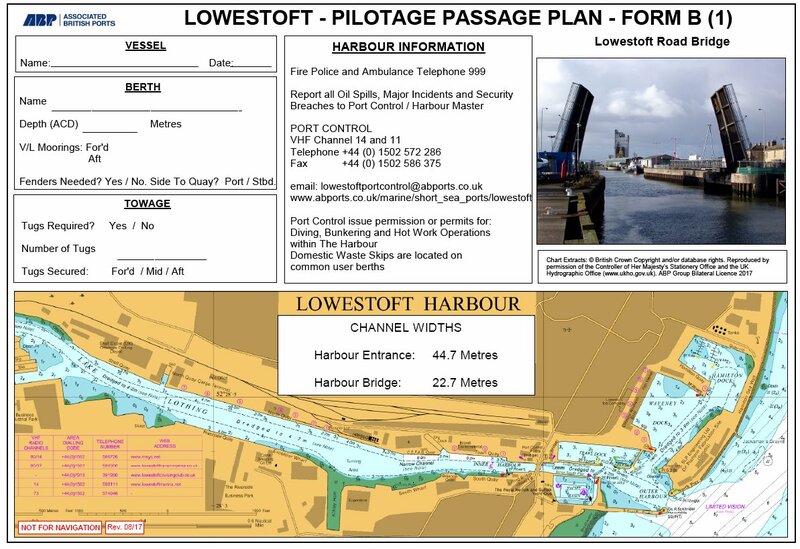 Mariners and Port-Users are advised that the information note for Small Craft and Yachts using Lowestoft Harbour has been revised and is attached to this notice. This revision precedes all previous revisions. Please bring this notice and the revision of the Information to the attention of all Mariners and Port-Users operating in this area. Mariners and Port-Users are advised that the yellow boarding ladder on the SE corner of the Hamilton Peninsula cannot be used until further notice. 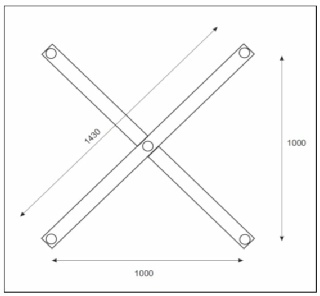 At this time it is unknown to when the ladder will be fit for use and a notice will be issued at this time. In addition, Notice to Mariner No. 33 – Lowestoft Outer Harbour – Bridge Channel Steps is now cancelled. • Yellow Special mark buoy "Z2" - Pillar Y, Cross Y ‘X’ topmark, Fl (4) Y 10s in position Lat 52° 54.050’N., Long 000° 16.115’E. The area of foul Ground extends approx. 1000m to NNE and 1000m to SSW from the above position. *Foul Ground is defined as “as an area of foul ground, not dangerous to surface navigation, but to be avoided by vessels anchoring, trawling etc”. The chart symbol for foul ground is a pecked line surrounding a # symbol. 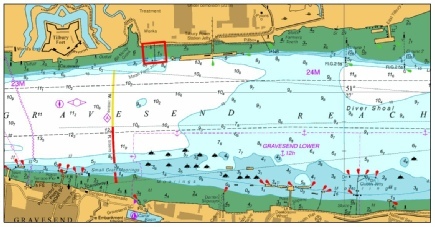 The attached chart extract details the location of the foul ground and associated Isolated Danger buoys. Please be advised that the contact number for the above has now changed to 0203 260 7711, please refrain from using the 0208 number going forward. 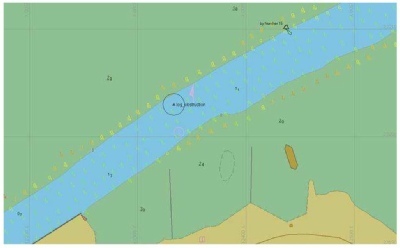 Further to the installation of the North Woolwich Barge Roads off Gallions Point, on the 21st November 2018 a new starboard lateral buoy will be installed in the location marked on the chartlet below. Mariners and Port-Users are advised that works to repair suspended quay support structures on the South side of the Bridge Channel, just East of the Bascule Bridge, will recommence from Monday 19th November. Vessels wishing to transit the area should contact Port Control to obtain information and advice on works activities. Vessels should only pass the works sites once permission has been granted, should afford as wide a berth as is safe and practical, and pass at slow speed to reduce vessel wash. Resumed works are expected to take until approx. one month to complete. Notification will be provided once works have been completed. East Coast of England - The Wash - Approaches to Kings Lynn. Position: Lat. 52° 45.320’N, Long. 000° 23.300’E. KING'S LYNN CONSERVANCY BOARD - Notice to Mariners No. 28 of 2018. Starting on 12th November 2018 in-channel flood gate replacement works will commence on the lock for the Gravesend Canal Basin. The majority of the works will take place at low tide with a temporary cofferdam being installed. 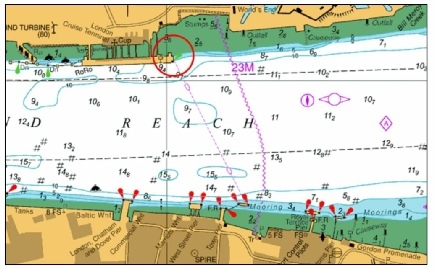 For this reasons a ‘Proceed with Caution’ will be issued by London VTS on VHF Channel 68 asking passing vessels to minimise their wash.
Navigation through the lock will be managed by the on-site team on an ad-hoc basis. Works are expected to last for approximately 12 weeks. On or about 12th November 2018, contractors working on behalf of McLaughlin & Harvey will be undertaking deconstruction works at Island Jetty for approximately 8 weeks. The works will be undertaken from the jack-up barge ‘COMMANDER’. The chartlet below depicts the location of the works and the limits of the navigation exclusion zone defined by the red boxed area. Only vessels engaged in the works may enter the exclusion zone. The jack-up barge will display the lights and shapes as prescribed in Rule 27 of the International Regulations for Preventing Collisions at Sea 1972, namely: • By day, three black shapes in a vertical line the highest and lowest of which are balls and the middle one a diamond. • By night, three all round lights in a vertical line the highest and lowest of which are red and the middle one white. London VTS will broadcast requests for vessels to “proceed with caution” or “proceed at slow speed”, as described in Permanent Notices to Mariners 4 of 2014 as required by the works. International Code Flags “Romeo Yankee” will be displayed when this is in effect. Please note that the BHA weather station, currently temporarily mounted on the Sailing Club dinghy park flagpole, will be removed tomorrow November 3rd. From tomorrow, it will not be possible to access data from this weather station on the Internet until early December (exact date will be advised), pending it’s long term installation on the South Sands beacon, which is positioned due South of the Old Lifeboat House. We are confident that in this position it will provide very accurate information regarding wind conditions in the Harbour. On Tuesday 16th October demolition works at Phoenix Wharf will commence. The works will take place from the Jack Up Barge COMMANDER and a spud leg barge. The tug HORTON will be in attendance to position the barges as required with a separate safety boat in attendance throughout the demolition works. These works will involve the demolition of ground moorings, timber dolphins, removal of the access walkway and loose rubbing strips to fender piles. Lifting operations will also take place with the removal of a concrete slab. Works are expected to be completed by the end of December 2018. All vessels involved with the works will maintain a continuous listening watch on VHF Channel 14. At times International Code flags “Romeo Yankee” will be exhibited in conjunction with a “Proceed with Caution” being broadcast by London VTS. This notice supersedes L20 of 2018, which is hereby cancelled. Due to the ongoing presence of a beluga whale, which is an IUCN red listed species, any vessels which are not required to operate in this area are advised to keep well clear. Vessels which need to operate in this area are required to keep a close lookout at all times. If the whale is sighted it should not be approached, speed should be reduced, and where possible a minimum distance of 100m from the whale should be maintained. Further information on marine protected species can be found on the Joint Nature Conservation Council’s website. For the latest navigation information contact London VTS on VHF Channel 68 or by telephone on 01474 560311. Mariners are advised that the latitude and longitude promulgated in Notice to Mariners No 33 of 2018 for the Raysand Middle Unlighted Buoy was an approximate position. NOTICE IS HEREBY GIVEN that a small leisure craft has sunk on her moorings in approximate position 52° 35.075’ North 001° 43.750’ East (alongside the Southern mooring dolphin close West of the ‘Ocean Terminal’ reporting point). The wreck will shortly be marked by two special marks at the NE and SE extremities lit during darkness with characteristic Fl.Y.5s. Some debris may be present and there may be lines or other hazards trailing close to the wreck. 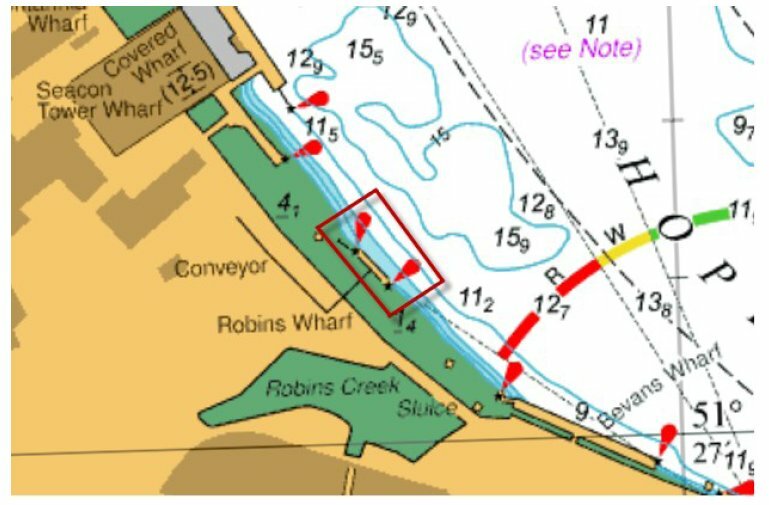 A restriction to non-essential operations will be in force with immediate effect south of the authorised navigation channel from Denton Wharf to Shornmead Light. This is as a result on the ongoing presence of a beluga whale, which is a IUCN red listed species, in Gravesend Reach Lower. This restriction is on all non-essential vessels not required to be in this area. Any vessels required to operate in this area are required to keep a close lookout at all time, keep speed to a minimum and maintain a minimum distance of 100m from the whale. Vessel Traffic Services will be monitoring the area throughout the restriction along with assistance from the Harbour Service Launch. For the latest information about the restriction contact London VTS on VHF Channel 68 or by telephone on 01474 560311. Additional information on the whale can be found at http://pla.co.uk/BDMLR-and-PLA-jointpress-statement. For further information please contact the King’s Lynn Harbour Radio on VHF 14. KING'S LYNN CONSERVANCY BOARD Notice to Mariners No. 25 fo 2018. Amendment : Topmark permanently withdrawn. Mariners are advised that from 1 to 5 October, there will be a submerged hazard in the Range Inner Sea Area. The hazard will be marked by yellow illuminated marker buoys. The co-ordinates of the hazard are as below and the location is also indicated on the map attached. Mariners are advised that the lighted beacon “Charlie” in position 52° 48.’759N 00° 21.’138E has collapsed. The area of the beacon is to be considered a Foul Area and all craft must keep well clear of the above position. Salvage operations are scheduled to commence 11th September 2018 and decisions regarding future replacement will be made after due consultations. KING'S LYNN CONSERVANCY BOARD Notice to Mariners No. 24/2018. The Thames Flood Barrier will be closed once a month for test purposes, in accordance with a programme issued for a period of six months, commencing 01st November 2018. Listed below are the times between which the Thames Barrier will be closed to navigation for test purposes. 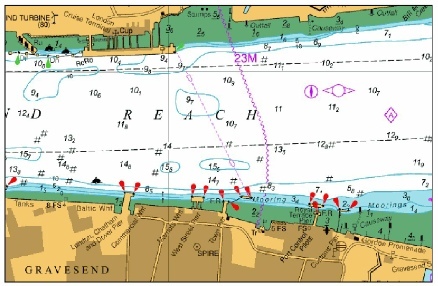 During these periods navigation in the Thames Barrier Control Zone, between Margaretness and Blackwall Point, will be restricted and any movements in this area will require permission from London VTS. The closures will be confirmed and promulgated by London VTS from 24 hours in advance of the operation by VHF radio on routine river broadcasts. From the start of each closing procedure until completion of the opening procedure vessels will be prohibited from transiting the Thames Barrier. Most closures are for approximately 2½ hours over the respective low waters. No vessel is to pass Margaretness inward bound or Blackwall Point outward bound once a Thames Barrier closure has commenced unless authorised by London VTS. GATE CLOSURES: In addition to the full Thames Barrier closures there will be frequent closures of individual gates for maintenance and training purposes, subject to a programme issued by the Environment Agency. The closure of individual gates will change the spans available for navigation. Information regarding these gate closures will be promulgated by London VTS on VHF Channel 14 routine river broadcasts. A copy of the six month programme may be obtained by applying in writing to the Environment Agency, Thames Barrier, Eastmoor Street, London SE7 8LX. During each full Thames Barrier or individual gate closure(s), illuminated red crosses will be displayed on both sides of the gate(s) indicating that the gate(s) are closed to navigation. (1) ANY ADDITIONAL THAMES BARRIER CLOSURES FOR TEST PURPOSES WILL BE PROMULGATED BY SEPARATE NOTICES TO MARINERS ISSUED 28 DAYS IN ADVANCE OF SUCH CLOSURES. (2) THE BARKING BARRIER WILL BE CLOSED AT THE SAME TIME AS THE THAMES BARRIER. Due to the deteriorated condition of West Street Pier, Mariners are advised that a “Proceed with Caution” is in place until further notice. Mariners should ensure they pass the pier at an appropriate speed to ensure minimum wash, in order to prevent further deterioration to the structure. Vessels are instructed not to moor at West Street Pier until further notice. Mariners and recreational users are advised that the Leigh Buoy has been moved approximately 170m to the NNE of her current charted position to reflect changes in depths in the area. The buoy is now in position 51°31.09N 00°42.72E. (d) A vessel shall not cross a narrow channel or fairway if such crossing impedes the passage of a vessel which can safely navigate only within such channel or fairway. The latter may use the sound signal prescribed in Rule 34(d) [At least five short and rapid blasts on the ship’s whistle] if in doubt as to the intention of the crossing vessel. (g) Any vessel shall if circumstances of the case admit avoid anchoring in a narrow channel. All commercial ships navigating in the Burnham Fairway will have a Crouch Harbour Authority [CHA] licensed pilot onboard. They will be monitoring VHF Channel 11 whilst within the CHA district. Do not impede these vessels as they can only navigate safely within the Fairway due to amongst other factors constraint of draught. A ship that is slowing down may not steer very well; it needs propeller action on the rudder to respond, it takes time and considerable distance to stop a ship particularly if it is in a loaded condition. Ships in narrow channels cannot easily avoid small craft, it is best that you stay clear. Be especially cautious and vigilant at night or in times of poor visibility, above all keep a good lookout both ahead and astern. If you cannot see the ships wheelhouse, the ship cannot see you. KING'S LYNN CONSERVANCY BOARD. Notice to Mariners No. 15/2018. 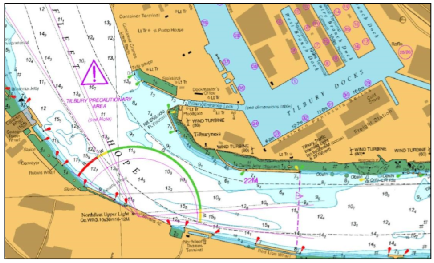 Mariners are advised that the works formerly promulgated in Notice to Mariners M13 of 2018 will continue on the Thames Barrier to upgrade the existing navigation lights on each of the piers. These works are expected to last approximately three months. In order to facilitate continued safe navigation through the Thames Barrier a temporary red cross will be utilised to indicate a span that is currently closed to navigation from one or both directions. For the latest information contact London VTS on VHF Channel 14 or by telephone on 0208 855 0315. Mariners are advised that the N.W. Roughs Tower Buoy [West Cardinal YBY VQ(9)] in position 51° 53.813’ N 01° 28.771’ E has been reported as damaged and leaning over. 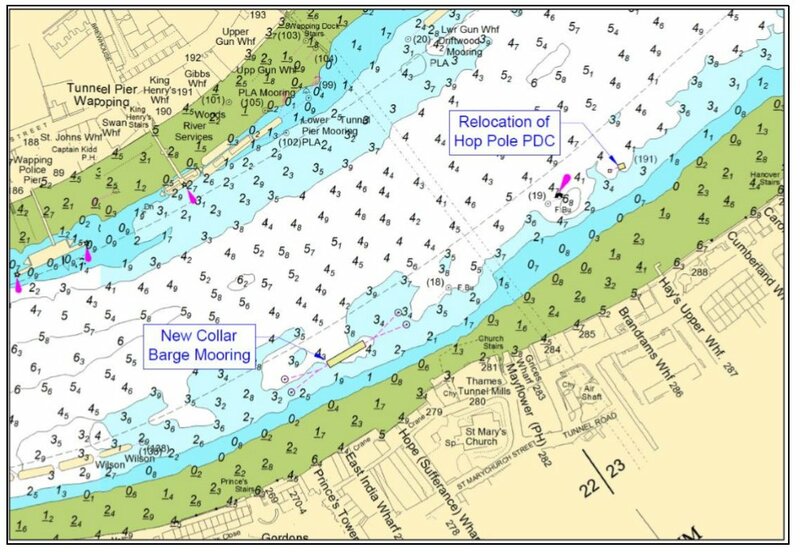 See attached chart extract showing proposed changes to buoyage. 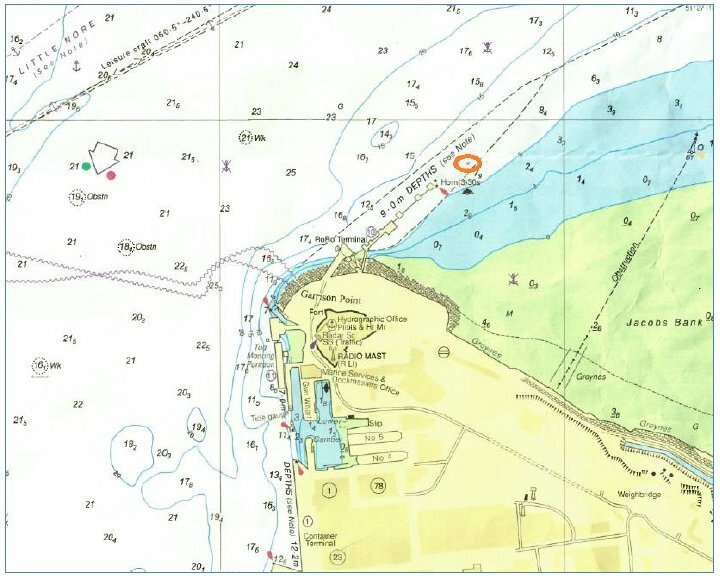 Mariners are advised that commercial shipping may be encountered outside of the buoyed channel in this vicinity until the buoys are moved. KING'S LYNN CONSERVANCY BOARD. Notice to Mariners No. 14/2018. Mariners are advised that the yellow spherical mark buoy, placed north of the temporary sculpture at Margate Harbour, will be removed for repair until further notice. will be off station until further notice. 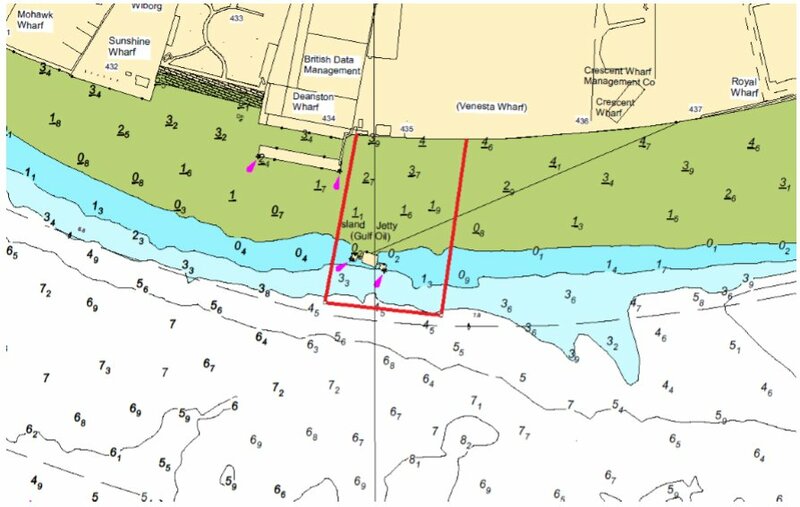 NOTICE IS HEREBY GIVEN That the Bokalift-1 shall commence works within the windfarm limits bounded by the EA ONE construction buoyage on the 24th March 2018 until further notice. The Bokalift-1 can be contacted on VHF CH16 and via Guard Vessel Glomar Drifa. The Bokalift-1 will be carrying out pile driving operations around 1200kj impact. The Silver Harvester will be noise monitoring close to the Bokalift-1. The Bokalift-1 will commence piling operations inside the CDM area of East Anglia 1 Windfarm. NOTICE IS HEREBY GIVEN Glomar Drifa shall commence Guard vessel duties within the windfarm limits bounded by the EA ONE construction buoyage on the 10th March 2018 until further notice. There has been a change to the buoy at the Bar End North (North Outer). The red can buoy has been replaced with a yellow buoy Fl Y 2.5s. 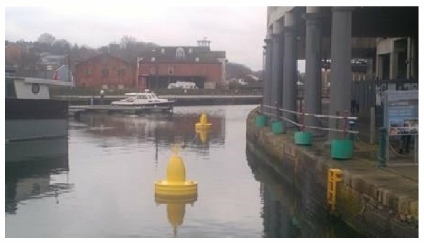 This buoy is being trialled for four months to help identify the buoy from seaward. The special mark will be positioned at the bar end and will have safe water on all sides for passing. The yellow special mark will have a flashing sequence Fl Y 2.5s. Mariners and Port users are advised for a period of approximately 12 Months there is an area of Restricted Navigation around Albion Wharf in the Wet Dock. During the rebuilding of the ‘wine rack’ scaffolding will protrude 3m out above the wet dock. 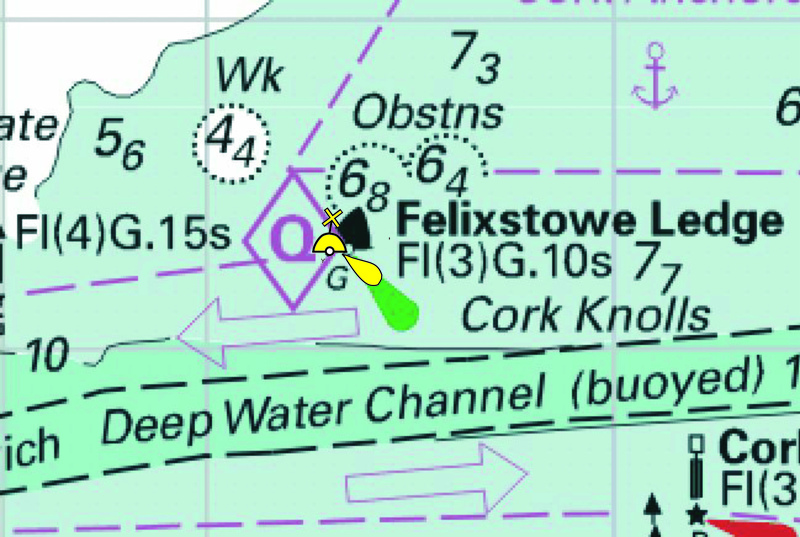 The area has been marked by 2 x yellow buoys as in photograph below. Please keep South of the yellow Buoys. Notice to Mariners No.1810 refers. Mariners are advised that No.16 light buoy and associated mooring has been salvaged and all markers buoys removed. 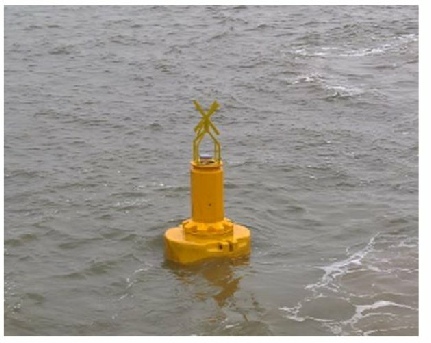 A temporary yellow navigation buoy (see picture opposite) with yellow light Fl (3)Y10s has been established in position 52° 51’365N 00°21’.270E until a replacement No.16 light buoy can be established. KING'S LYNN CONSERVANCY BOARD. Notice to Mariners No. 9 of 2018. Mariners and Port Users are advised that the East Cardinal ‘Sewer’ Buoy, in position 52° 28.89’N, 001° 46.24’E, is unlit. The buoy remains in position, so mariners are requested to navigate with caution in darkness in the vicinity of the unlit buoy. Confirmation will be provided when the light has been reinstated. Position of 'sagging' indicated by a Wpt icon. 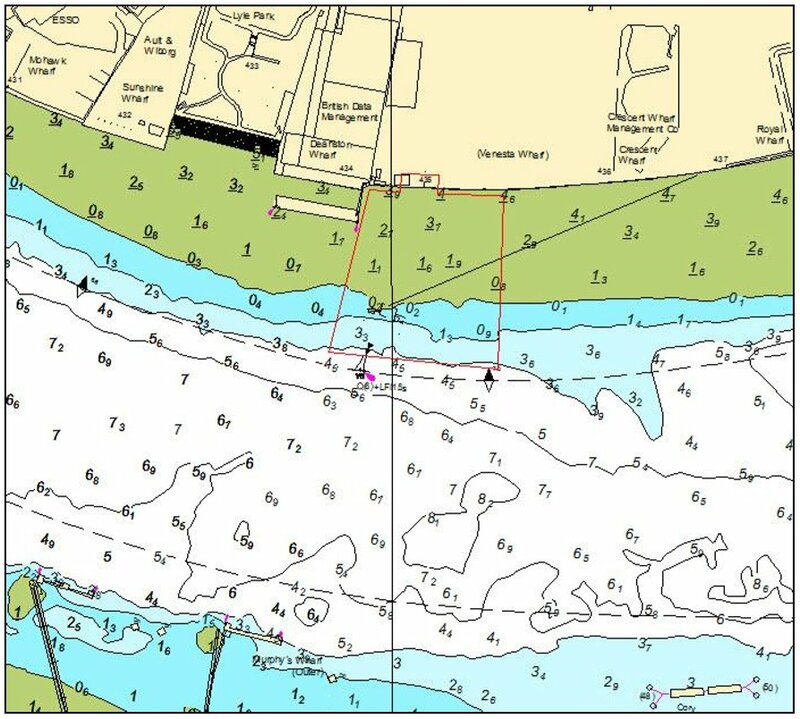 Please ensure that the new position is taken into consideration for passage planning and when navigating in this area. Please be advised that the Multi-Cat “Coastal Discovery” is expected to commence operations at Galloper Offshore Windfarm circa 15th December 2017 until further notice. 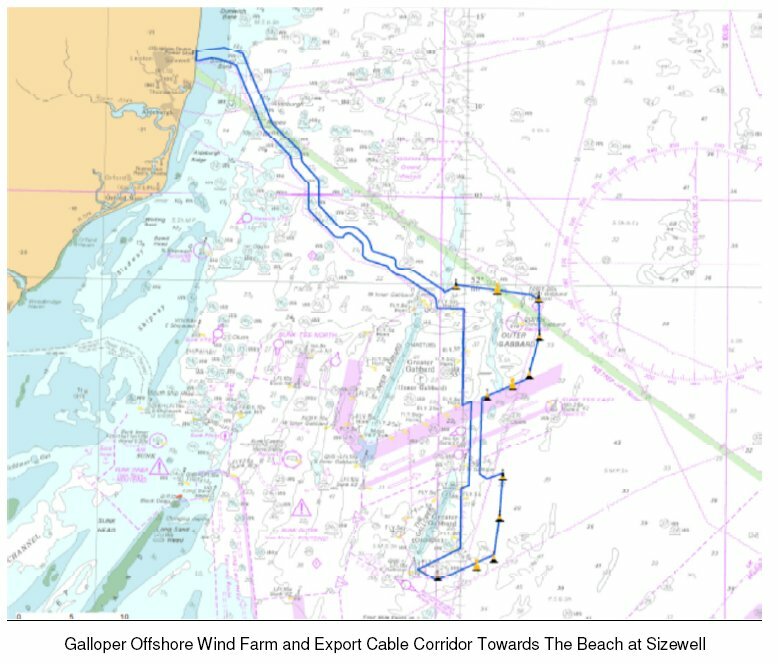 The vessel will be conducting Subsea cable works in the vicinity of Sizewell beach (approximately 300m at nearest point). The vessel can be contacted on VHF Channel 16 throughout for any further information. 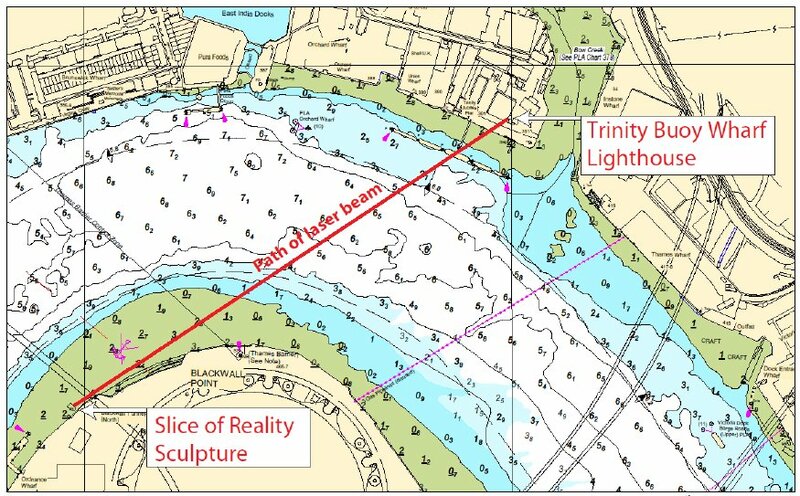 Mariners are advised that on or about 4th December 2017, contractors working on behalf of the Tideway Tunnel Project will undertake the installation a new collar barge mooring along with relocation of the Hop Pole PDC. 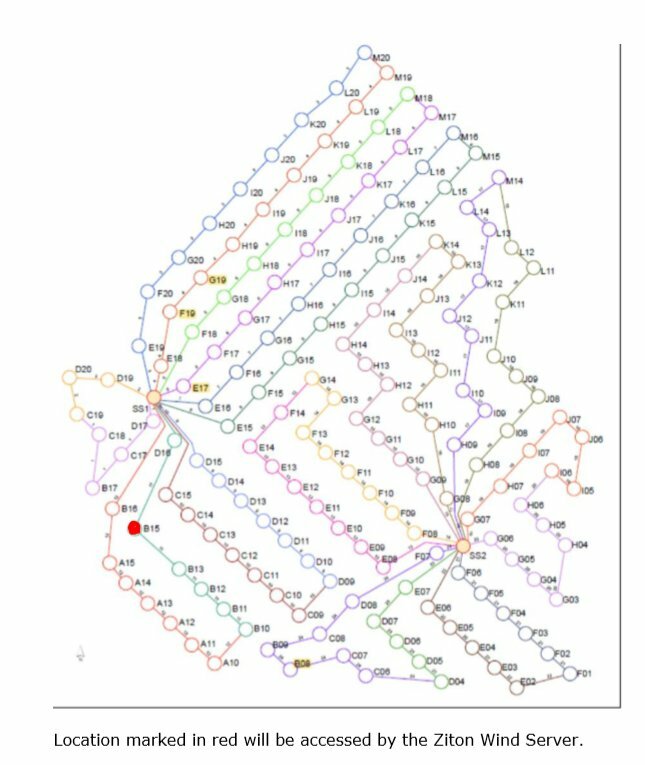 Please see the chartlet opposite depicting the locations of the resultant works. The works will involve relocating the existing PDC on 4th December using the PLA DRIFTWOOD craft. Installing the screw moorings and buoying off on the 5th and 6th December using the PLA vessel LONDON TITAN. On the 7/8th of December the Cory Collar barge at Blackfriars will be relocated to the new mooring to be known as PLA Tunnel Mills Barge Roads, and the Blackfriars barge mooring will be dropped to the river bed. All vessels involved in the works will maintain a continuous listening watch on VHF channel 14. Vessels are requested to be mindful of their wash when passing the works and to pass at a safe distance. The HJORDIS EAST buoy at the entrance to Blakeney Harbour is off-station until further notice. Vessels entering Blakeney Harbour should enter the harbour with caution, leaving the HJORDIS isolated danger beacon at least 200 metres to starboard, then pass the Harbour Entrance buoy No.1 close to starboard. Mariners are advised that on 2 occasions within the last 6 weeks small craft have made contact with the Green Harbour Buoy on its charted position 51˚19’.685’N - 001˚ 25.315’E whilst entering the Port of Ramsgate at low water. 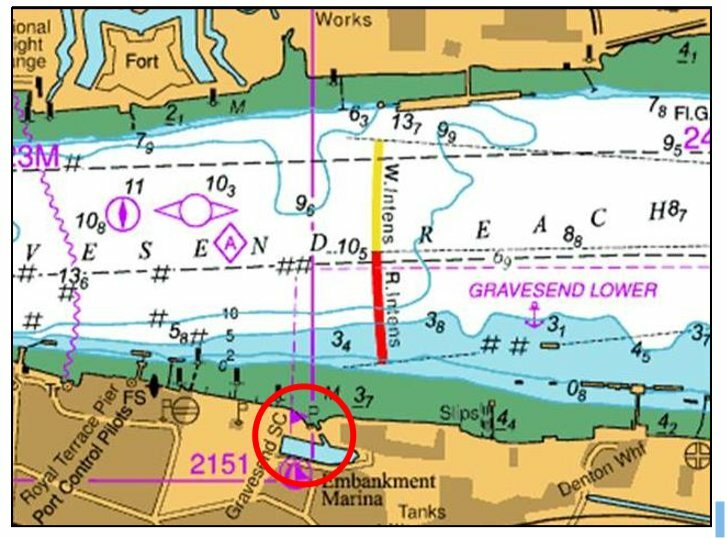 We would like to remind our harbour users to observe the practice of good seamanship when transiting in and out of the Port at low water and to follow the recommended route as per Admiralty Chart 1828. Re-Fuelling or Bunkering fuel within the Harbour. Re- fueling within the Harbour on the pontoons or within the marina is prohibited. The Harbour has a designated fuel pontoon and designated trained staff to dispense fuel with the capability and equipment to deal with a fuel spill. Under no circumstances are boat owners to re- fuel afloat within the Harbour. 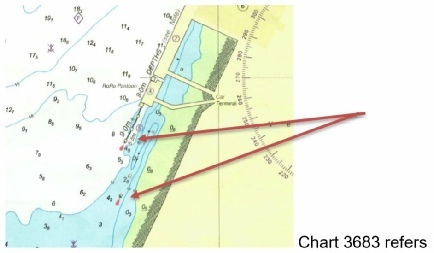 maximum speed in the port area of seven knots over the ground is not necessarily a safe speed and consideration must be given to other vessels moored within the Port, vessel specific wash generation characteristics and tidal speed and direction amongst others. Vessels have been reported to be both unlit or insufficiently lit whilst berthed during hours of darkness and under conditions of restricted visibility therefore endangering safe navigation within the Port area. Please be advised that survey works are expected to commence at Galloper Wind Farm circa week commencing 23rd October 2017 until further notice. Works will be conducted from the survey vessel “Spectrum 1”. Spectrum 1 shall exhibit the correct day shapes / night lights when carrying out operations and requests a wide berth during this period. Spectrum1 can be contacted via VHF Channel 16 throughout when underway. 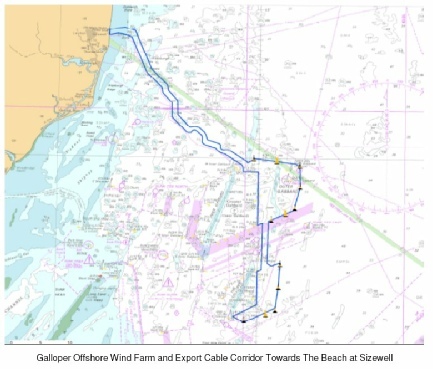 The Secretary of State has approved the Application of Safety Zones on the Galloper Wind Farm Project. A Statutory 500m Safety Zone is in place at the location of each wind turbine, Offshore Sub Station and their foundations whilst work is being performed as indicated by the presence of construction vessels. A Statutory 50m Safety Zone around all structures including the Offshore Sub Station whilst personnel are working on said locations. 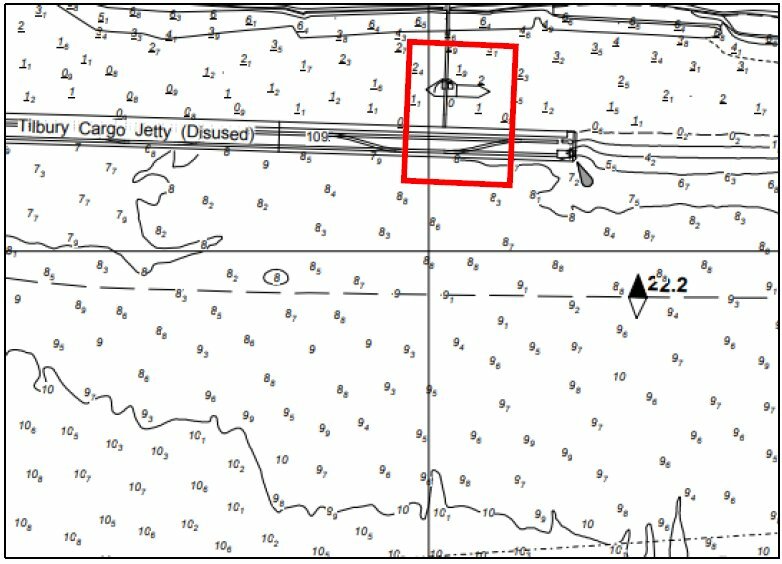 Mariners are advised that on or about 17th October 2017 as part of works to the Oikos Jetty No. 2, a temporary south cardinal mark will be installed in position 51° 30’ 20.457”N 000° 33’ 37.183”E as shown on the following chartlet. The south cardinal will indicate the safe side to pass in relation to piling works which are currently ongoing for the extension of the existing No. 2 jetty. 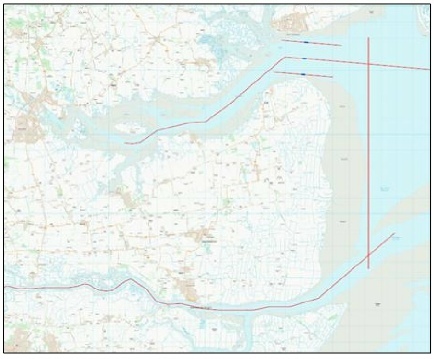 Mariners and Port users are advised that the UKHO has recently published a new edition of navigational chart BA1535, Lowestoft Port and Approaches. Sounding data from this chart has been used to update the Port’s Passage Plan chart and vessel tracks. A copy of the chart is attached indicating the tracks likely to be followed by commercial vessels entering and leaving the port of Lowestoft. Masters and Skippers of leisure craft and small vessels should use this information when planning their own passage in the vicinity of the Port of Lowestoft. If further information is required please contact Lowestoft Port Control on VHF CH14 or Tel. No. 01502 572286. 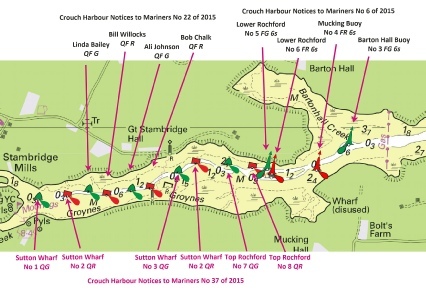 A useful local chartlet and comprehensive information exists for anyone wanting to enter the harbour. Mariners and Port-Users are reminded of the requirement to make contact with Lowestoft Port Control, on VHF Ch14, before port arrival, port departure, and for any internal Harbour transit at Lowestoft. This requirement covers all vessels, including fishing vessels and leisure vessels. For departures and in-harbour transits, vessels are requested to report intentions via VHF 14 before leaving any berth or area. If vessels/craft do not have VHF radio, then port control must be contacted via telephone, no. 01502 572286. Please bring this notice to the attention of any port users or vessel owners/operators not included as a recipient of local notices. All mariners are reminded of their duty to report accidents and incidents in the Thames in accordance with the Port of London Thames Byelaws, no. 8. 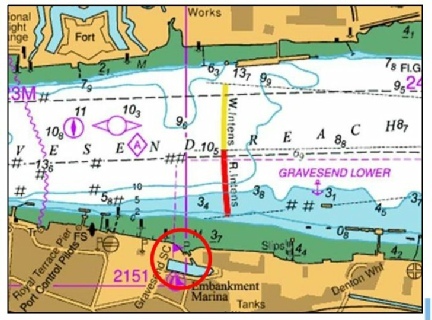 A recent survey of the Princes Channel showed a reduction to the published depth in one area, which was almost certainly caused by a vessel grounding as the result of squat. 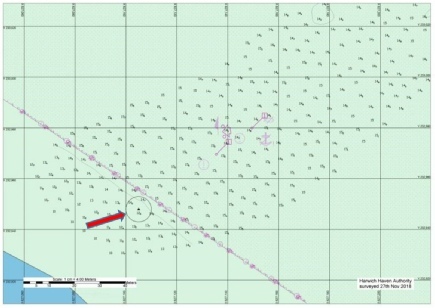 This grounding was not reported at the time and therefore the shoal patch was not discovered until a routine survey was carried out. If the grounding had been reported at the time a check survey could have been undertaken. This would have shown the area of reduced depth, which would then have been promulgated to river users. Thankfully on this occasion the unknown shoaling did not lead to another vessel taking the ground, but certainly had the potential to do so. Following an incident or accident a verbal report must be made immediately to the harbourmaster, either directly or through London VTS. This must be followed up with a written report as soon as is practicable and should contain sufficient detail for the Harbour Master to be able to commence an investigation without the need to clarify basic details which can often delay the investigation process and potentially increase the risk of a repeat incident before the PLA is able to react and implement new safety measures. Failure to report an incident or accident in accordance with the Thames Byelaws is an offence and could lead to prosecution. Mariners are advised that a temporary sculpture will be erected on the area known as Fulsam Rock, approximately 80m north from the sea wall adjacent to the Turner Contemporary and Rendezvous. Works are scheduled to take place between the 17th & 28th July. In Consultation with the RNLI and Ramsgate/Margate Harbour Master a yellow special mark buoy with radar reflector will be placed north of the sculpture and pier foundation (between the foundation and the tidal gauge) as a warning and instruction to mariners & leisure users. Mariners are advised of the deployment of 2 special lit ‘NO WASH ZONE’ buoys at the Eastern and Western ends of Essex Marina. Both buoys are positioned clear of the main fairway. 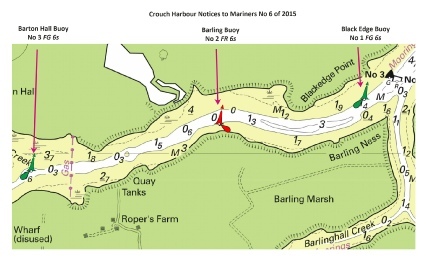 There has been a change to the channel at the entrance between the Outer Bar North and Number 3 buoy. All buoys have been relocated to the new channel. 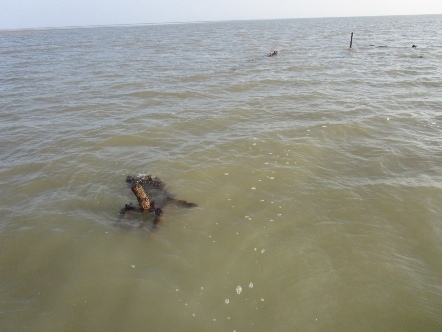 Now believed to be a wreck of possibly up to 70 feet in length, stanchions have been sighted at low water approximately 1 metre above the water. 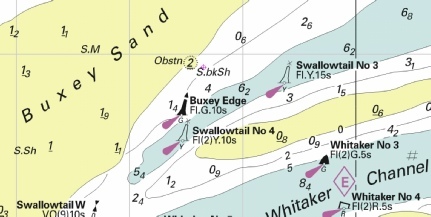 Mariners are advised to remain within or close to the Fairway between Swallowtail No 4 and Buxey Edge buoys when navigating in this area. This is an 'unofficial' notice to Mariners. I have been told by Mr Alan Bird, a local oyster dredger and yachtsman who has seen detail of the 'Obstruction' in the channel between the Swallowtail and the Buxey Sand. Charts currently show there is an 'Obstn' drying 2m at 51.40'951N, 001.03'541E. 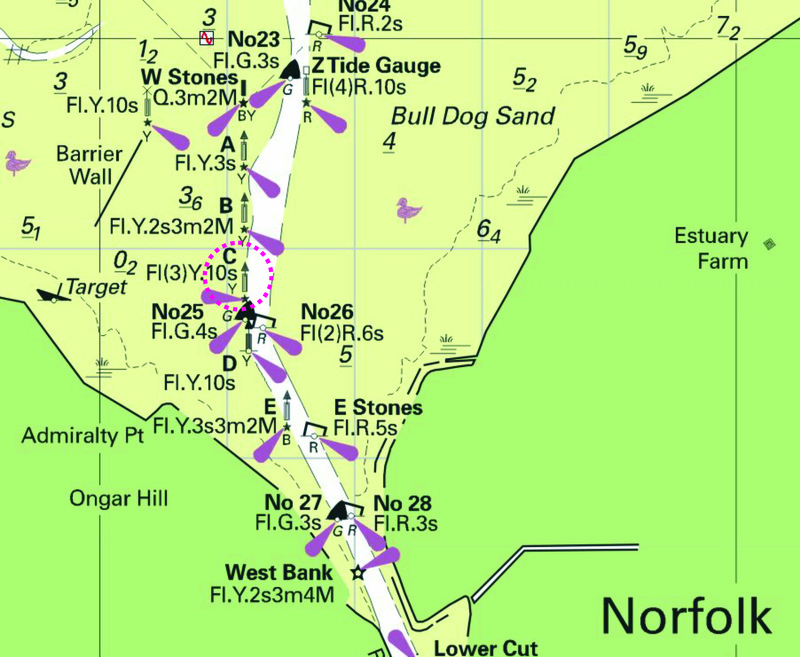 However, Mr Bird records the position as 51°40’924N 001°03’660E - which is further from the edge of the Buxey Sand in approximately 1.5m CD, narrowing the channel between the two sands - and believes the 'Obstn' is substantial and dangerous remains of a wreck. It is not marked! Mr Bird has submitted an H102 to the UKHO but kindly given me details of the wreck and a copy of the images. I have selected the best two images of the overview. Note that the tail end of the Swallowtail can be seen on the left of the image showing how narrow the channel is. The waypoint symbol on the chart image shows the position recorded by Mr Bird. 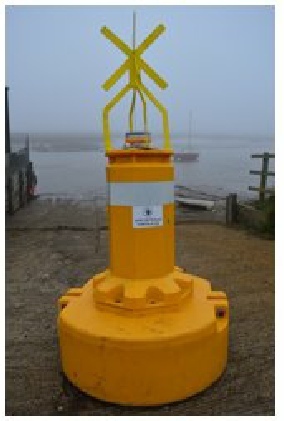 Be aware that Maldon District Council will be installing a new South Cardinal navigation mark within the River Blackwater, Essex during the forthcoming month The Unlit Yellow and Black navigation buoy will carry a topmark comprising two black triangles apex down. The unlit buoy will bear the name ‘TOLLESBURY PIER’ and has been requested by concerned river users. 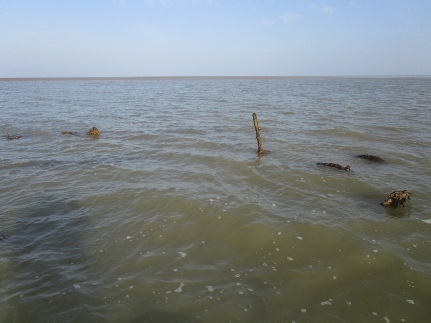 Upon further investigation it is evident that part of the intertidal area has recently eroded and has exposed a section of wooden stakes that were once the legs of Tollesbury Pier. 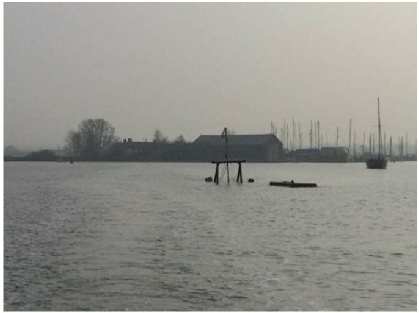 These posts pose a danger to navigation and river traffic is advised to avoid the area between the saltmarsh and the Tollesbury Pier South Cardinal Mark for reasons of safety. Mariners are advised that the following new buoys have now been established in Potton Creek, River Roach. Image courtesy of Imray chart Y17 and Meridian ID10. Please be advised that Fairway Buoys No 1, 2 and 4 Paglesham Reach, River Roach have been moved to new positions. Buoy and light characteristics remain unchanged. The repositioning has taken place in order to more clearly identify a Fairway clear of the numerous yacht moorings in the vicinity. The West Cardinal has been moved today 19th February 2016. Please find updated position of West Cardinal Buoy. Mariners are advised that the following new buoys have been established in the River Roach (Upper). The East Mouse Channel has been established in the Thames Estuary between the North Mouse and Mouse banks, and is marked by the repositioned Barrow 12 buoy and newly established Alice Wreck isolated danger buoy as per NTM L12 of 2015 (Admiralty NTM 3121 of 2015). Vessels that are constrained by their draught and which are unable to use the Mouse Channel may utilise the East Mouse Channel. Vessels using the East Mouse Channel should normally navigate to the north of the Alice Wreck buoy. 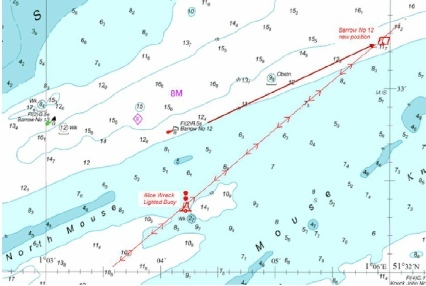 Vessels intending to use the East Mouse Channel should normally enter / exit at the Alice Wreck / Barrow 12 buoy. Outward bound vessels intending to use the East Mouse Channel should inform London VTS of their intentions when passing Sea Reach 4 buoy, or if departing the Medway Ports, on passing the wreck of the Richard Montgomery. Inward bound vessels intending to use the East Mouse Channel should inform London VTS of their intentions when passing Barrow 10 buoy. Further information is available from London VTS on VHF Channel 69 or by telephone on 01474 560311. Image copyright of the PLA.